Joyce and I just happen to love history. So we visit a lot of library type displays and museums. 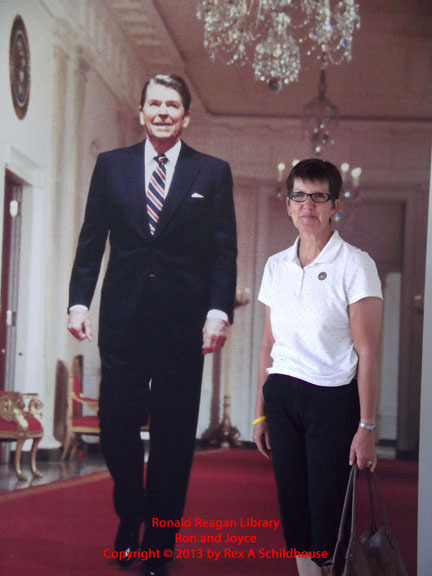 Our visits to the Reagan Presidential Library and the Nixon Presidential Library were neat. 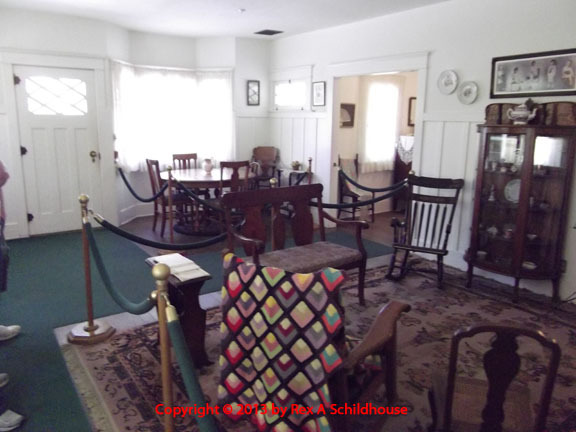 We have found museums that seem to be placed to be lost and museums that are not advertised well. This page TONS of graphics so it will take time to load. Ronald Wilson Reagan, born February 6, 1911, died June 5, 2004, was the 40th President of the United States of America serving from 1981 to 1989. 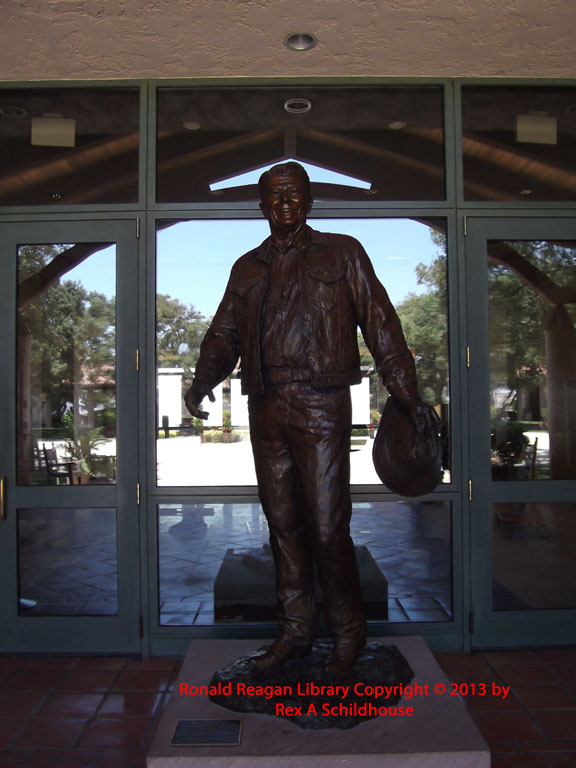 He entered the office with a reputation of being an Old West Gunslinger due to his movie and television roles and being an active conservative who believed in the United States and its Citizens. Iran released the American hostages after over one year of captivity without action just before Ronald Regan took office. It is believed that Iran was afraid that this Western Gunslinger President would free the hostages by force without regard to the cost Iran might incur. 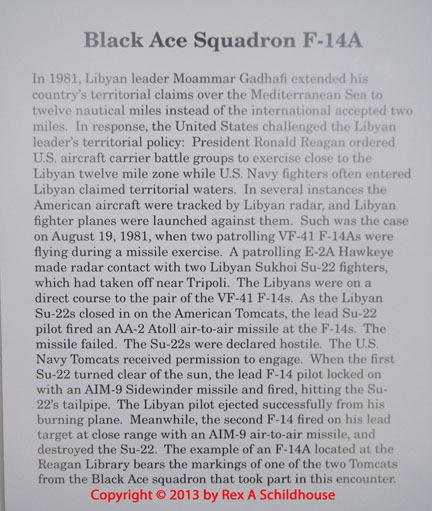 Later 1981 when Libya decided that open waters in the Mediterranean Sea were actually Libyan territorial waters Ronald Reagan ordered the U.S. Navy to back them down and the Libyan Air Force lost two fighters to U.S. Navy F-14s as they tried to enforce “The Line of Death” as Muammar Gaddafi titled it. In 1986 when it was believed that Libya directed the attack on U.S. Military personnel in Germany Reagan ordered the U.S. Military to bomb Libya. A very vocal Muammar Gaddafi became very quiet after that. In 1983 Reagan again put the U.S. Military into action to rescue U.S. Students in the Caribbean nation of Grenada. The young government of Grenada has been overthrown with the assistance of Soviet and Cuban military personnel. Ronald Reagan’s military programs and economic policies, called Reaganomics, resulted in the death of the Soviet Union as the USSR spent past their credit trying to keep up. As the Soviet Union crumbled Berlin was united for the first time since shortly after WWII as the Soviet constructed Berlin Wall fell. 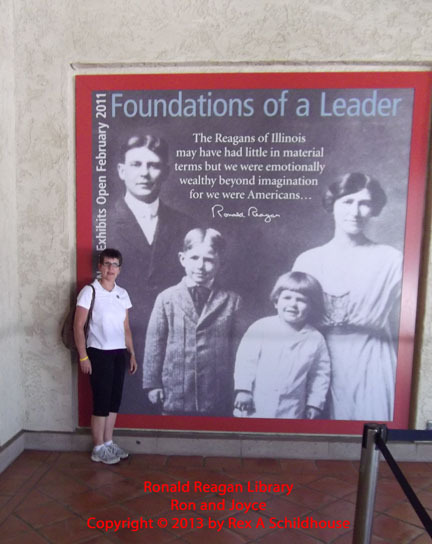 A conservative from his birth in Tampico, Illinois and childhood in Dixon, Illinois Ronald Reagan started a democrat and transitioned to the Republican Party in the early 1960s. 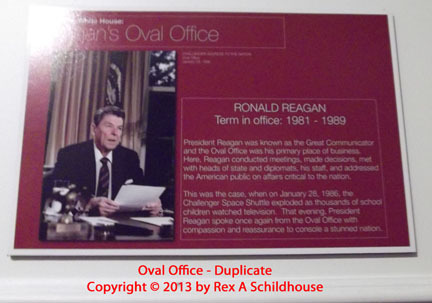 As a radio announcer, sports broadcaster, and movie actor, Ronald Reagan was “The Great Communicator” of legend. When he held a press conference or Oval Office chat you felt like he was speaking to you from a chair in your living room and you understood and remembered what he said for a long time. He always had a sense of humor and a chuckle. 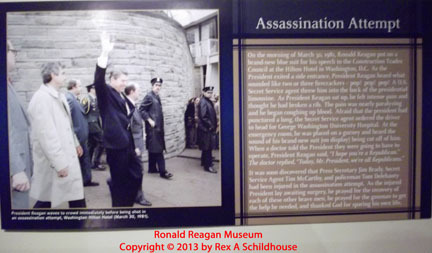 Ronald Reagan served in the United States Army Air Force / Air Corps from 1937 to 1945 leaving service as a Captain – O-3. He was not a pilot due to vision problems. His service generally focused around training films. He was never assigned overseas duties. 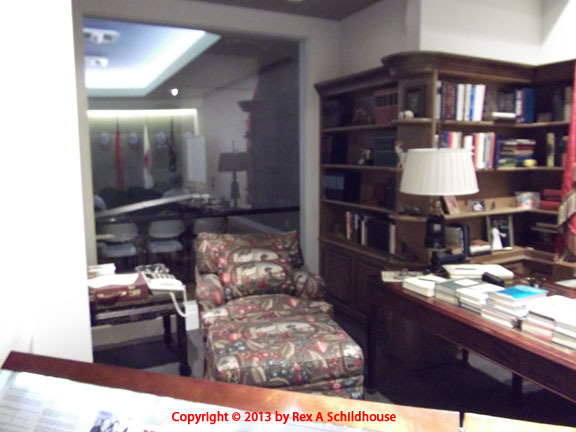 Upon touring his (Memorial) Library in early 2010, I was disappointed. 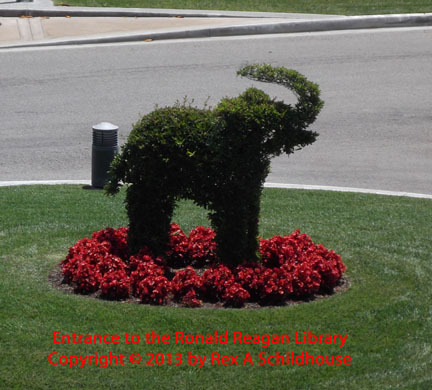 Ronald Wilson Reagan has accomplished many notable things during his life and little of it was actually addressed in the Library. 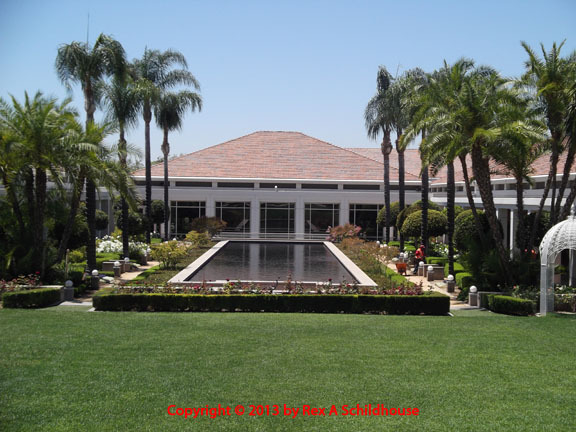 On the way home, a two-hour plus drive from the Simi Valley location it dawned on me. 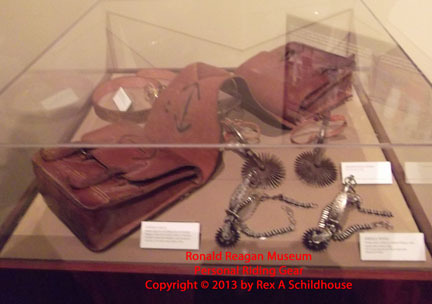 This was Ronald Wilson Reagan’s life. He was always a conservative. He often said something to the effect, “The American People did it, I just asked them to do it.” He helped design his library. His conservative attitude shows. It was appropriate. On the driveway into the Library. 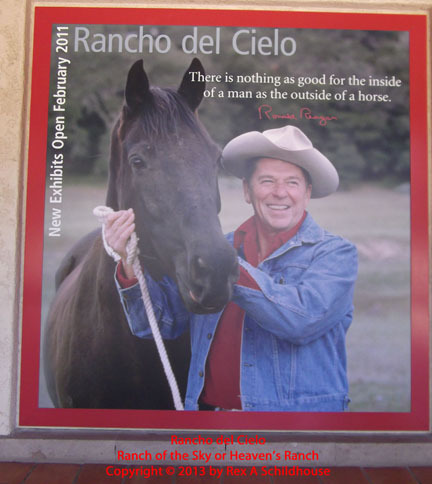 Ranch of the Sky or Heaven's Ranch. 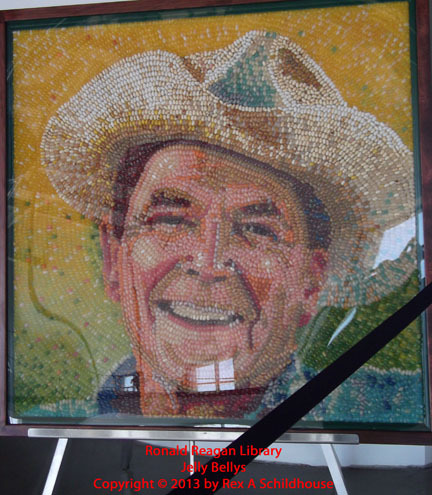 Ronald Reagan in Jelly Bellys. 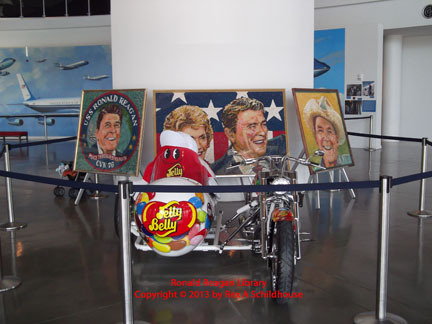 Ronald Reagan and Nancy Reagan in Jelly Bellys. 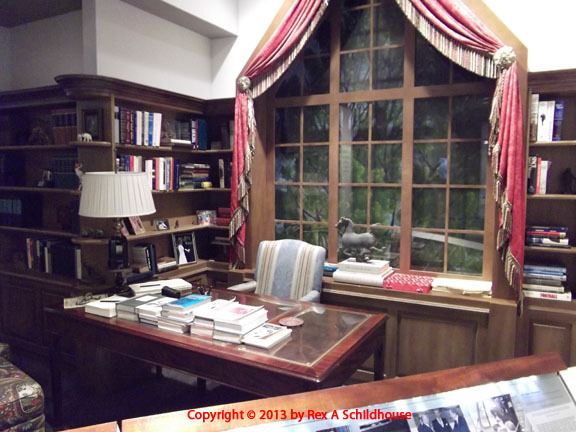 Replica of Ronald Reagan's Oval Office. 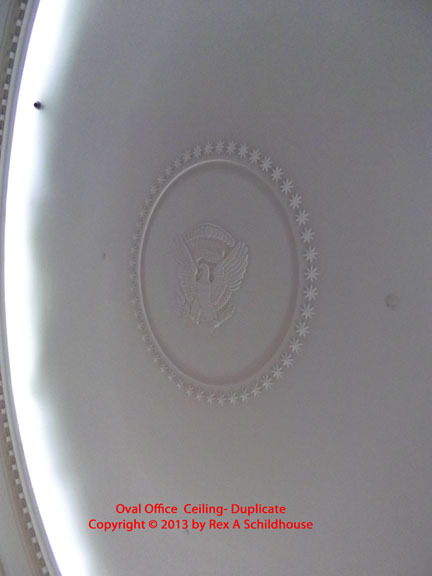 Replica Presidential Seal in the Oval Office ceiling. 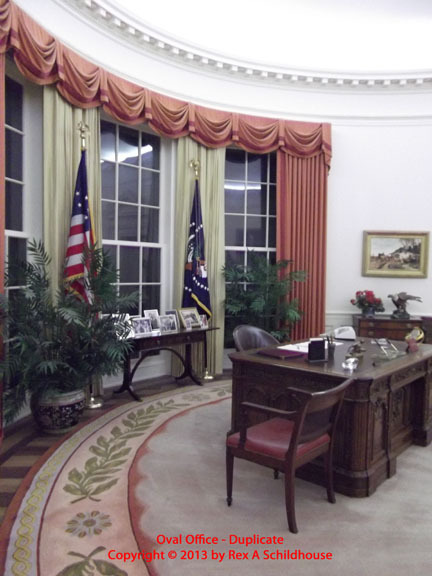 Ronald Reagan in the Oval Office. 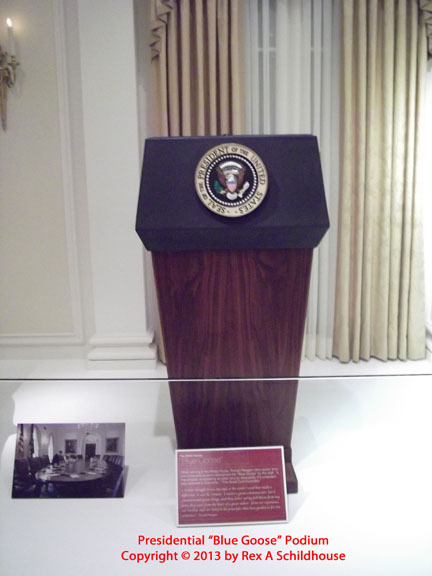 Presidential Podium nicknamed "The Blue Goose". 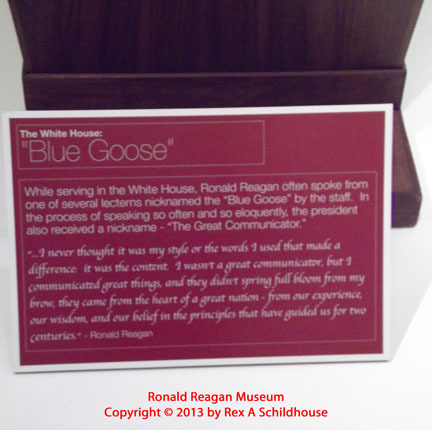 Presidential Podium nicknamed "The Blue Goose." 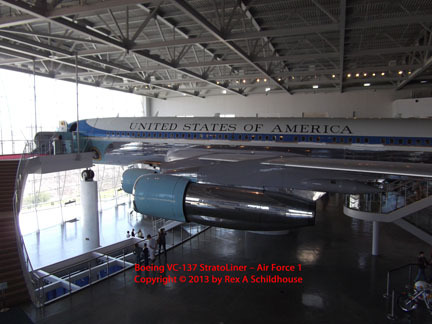 Air Force One, Boeing VC-137 StratoLiner. 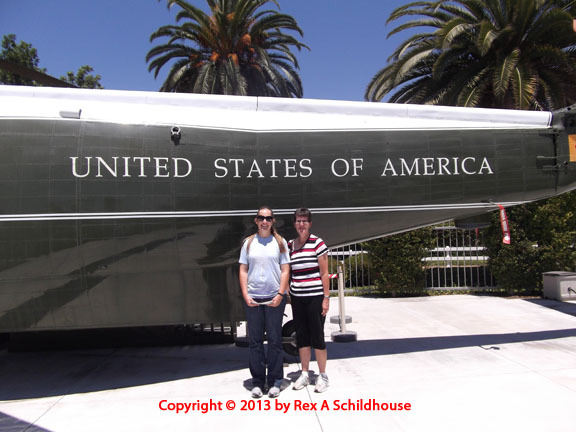 Various airplanes that flew the presidents - and ME! standing there. 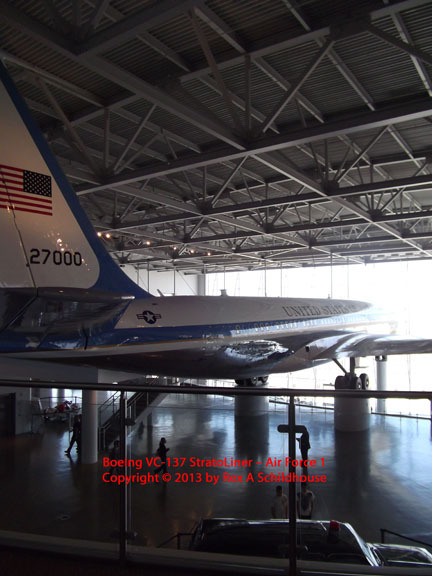 Various airplanes that flew the presidents - and ME! Standing there! 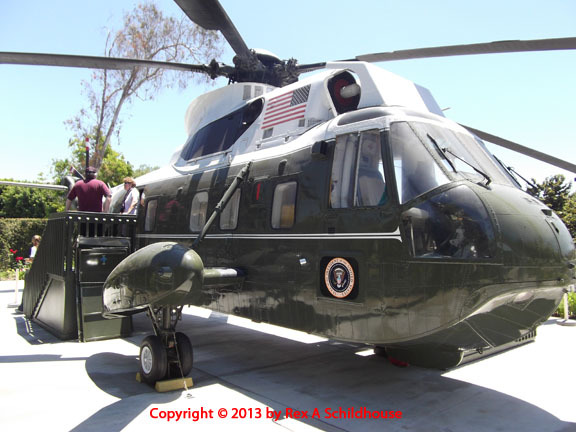 Marine 1, Sikorsky VH-3 Sea King. 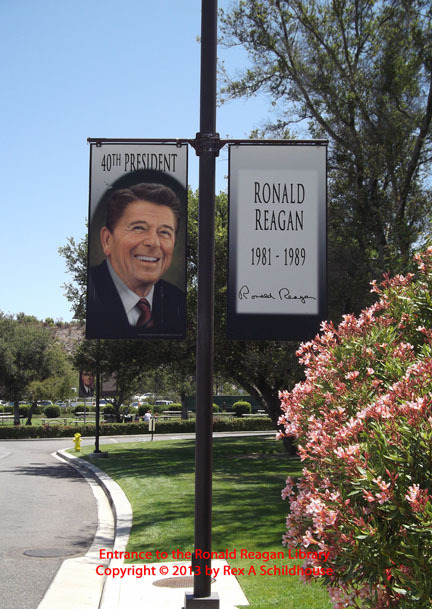 Flags from each country Ronald Reagan visited as president. 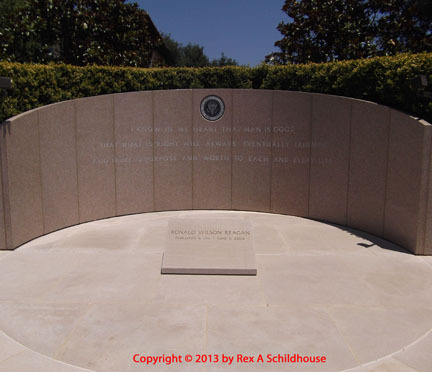 Burial site of Ronald Wilson Reagan. 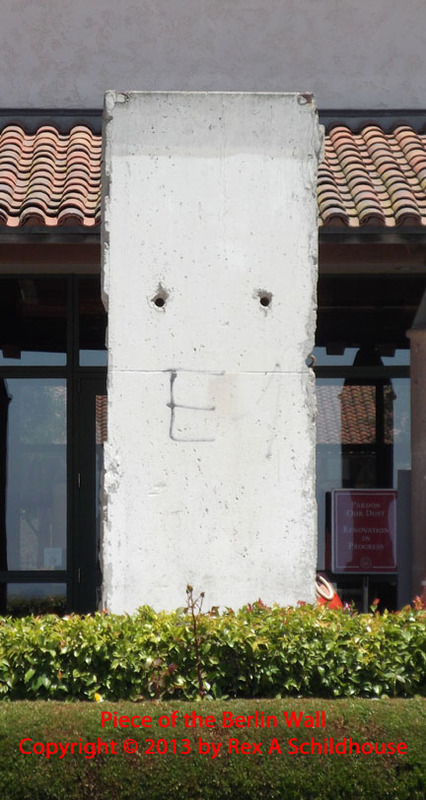 Chunk of the Berlin Wall. Info on Line of Death Event. Scenic View of Simi Valley. 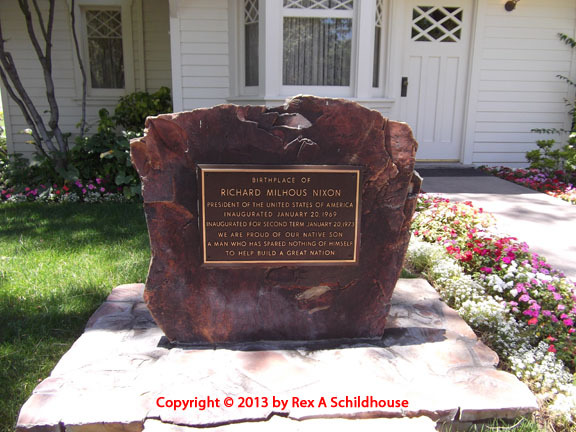 Richard Milhous Nixon was born in Yorba Linda, California on January 9, 1913, and died April 22, 1994, in New York City. 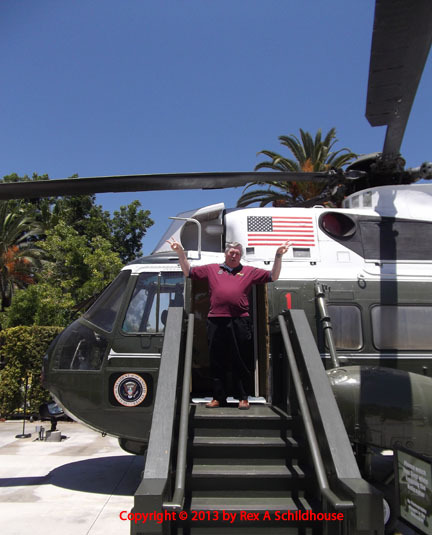 He is the only president of the United States of America to date to born and raised in California. 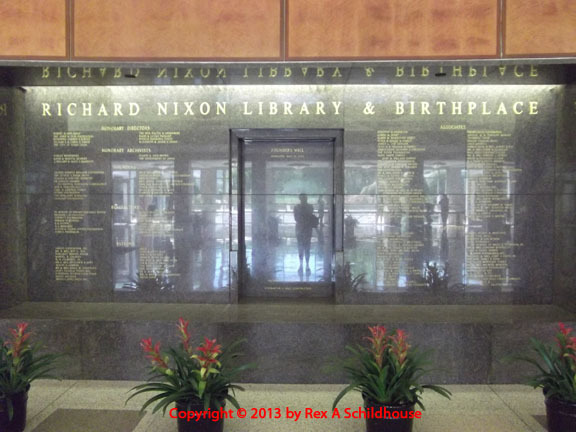 The library and museum kind of pass over one element of Nixon's life that he thought was very important. 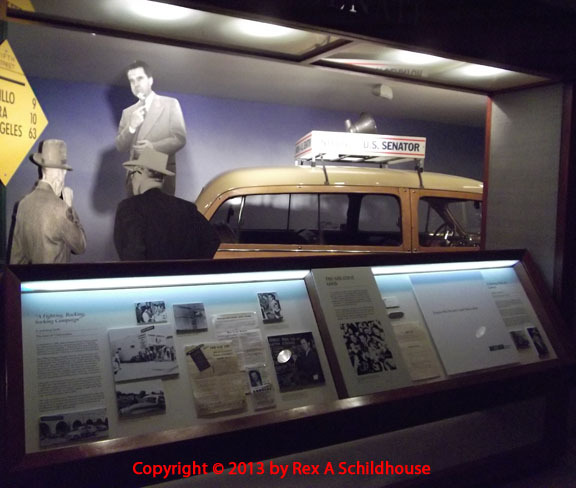 At the outbreak of WW II the Nixons moved to Washington, D.C. to work with the government. Shortly after that, August 17, 1942, he joined the Navy. His first duty station was in Ottumwa, Iowa, Radar O'Reilly's hometown. 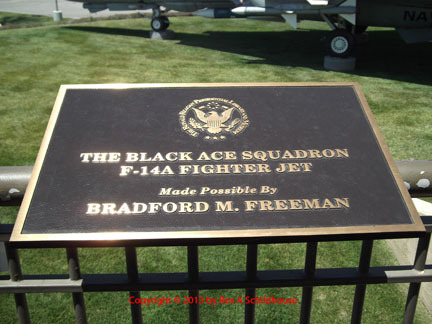 He was then transferred to the Combat Air Transport Command on the island of New Caledonia and, later, Bougainville in the Solomon Islands, and Green Island in the South Pacific. He completed his WW II service as a Lieutenant Commander and entered the U.S. Navy reserve where he retired as a Commander in 1996. Richard Nixon was elected to the U.S. House or Representatives where he served from 1947 to 1951. He was elected to the U.S. Senate in 1950 and served there until he was selected to serve from 1953 to 1961 as Dwight Eisenhower's Vice President with elections in 1952 and 1956. He lost the 1960 presidential election to John Kennedy, JFK, another WW II Navy Veteran. In the 1968 presidential elections Richard Nixon defeated Hubert Humphrey, partially due to the Vietnam War which had escalated significantly under the democratic administrations of JFK and LBJ from 1961 into 1969. 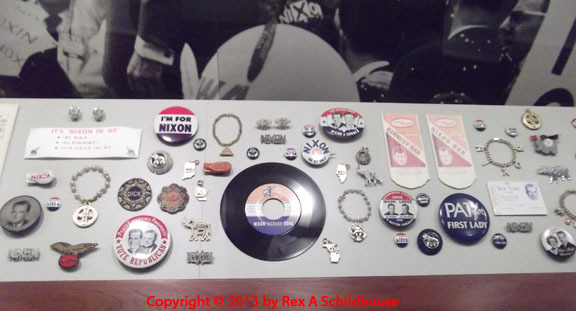 Nixon worked for on numerous fronts at the same time. Peace talks with North Vietnam, mostly secret, took over four years before an accord was reached. At the same time he was the first U.S. President to visit, and effectively open the People's Republic of China to the world and for world trade. 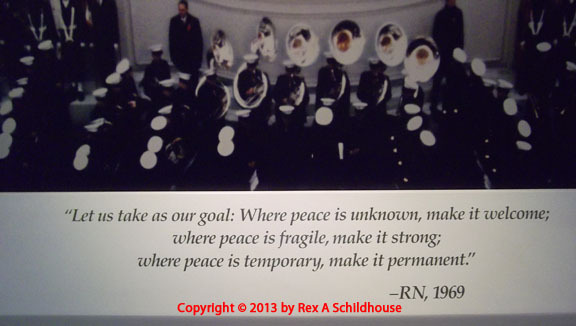 With trips to numerous foreign countries Nixon signed the first Strategic Arms Limitations Treaty (SALT) with the USSR. He is also the President that signed the 1971 bill ending the draft. 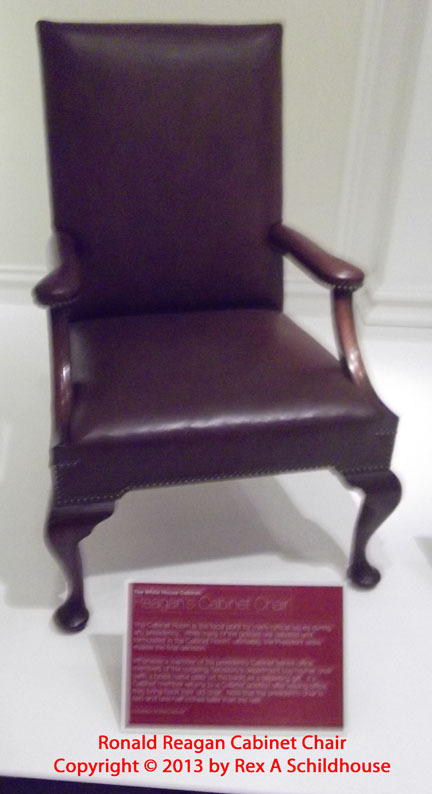 President Nixon will forever be remembered for the actions of his reelection committee in the Watergate Incident. 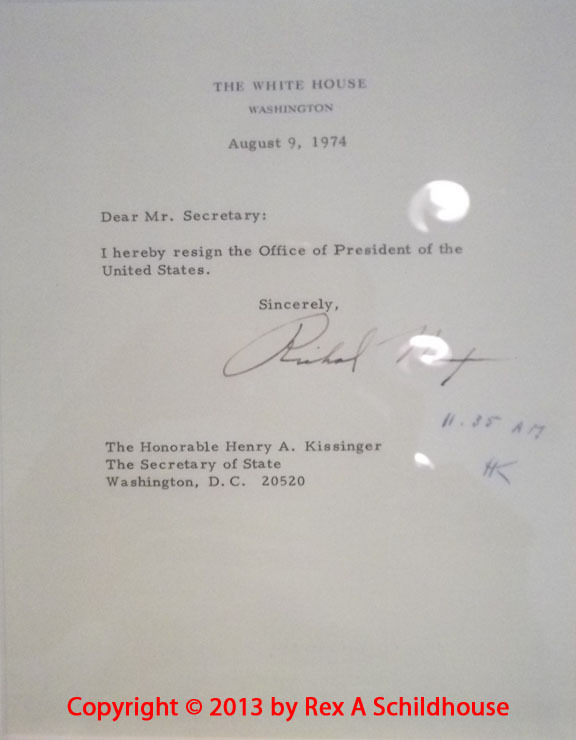 As a result of that incident and the loss of faith, Richard Milhous Nixon resigned from the Presidency on August 9, 1974. Personally I thought this was a very good presentation of President Nixon with the except of the down playing of his Navy service time. Well worth the time spent. 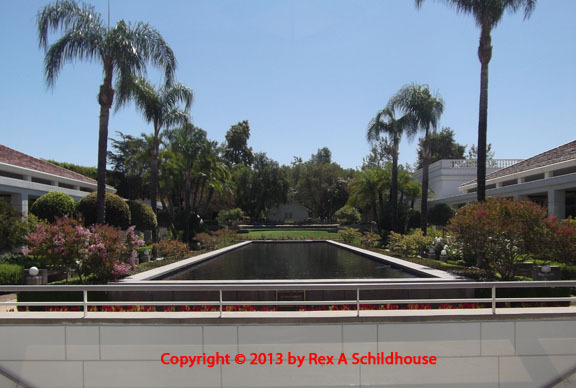 These first shots are the entrance to the Nixon Presidential Library and Museum. 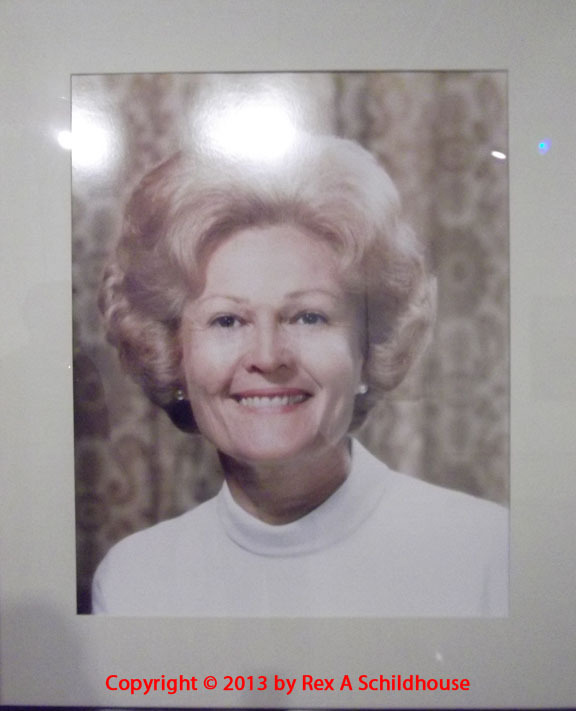 "Pat" (Thelma Catherine Ryan) Nixon. 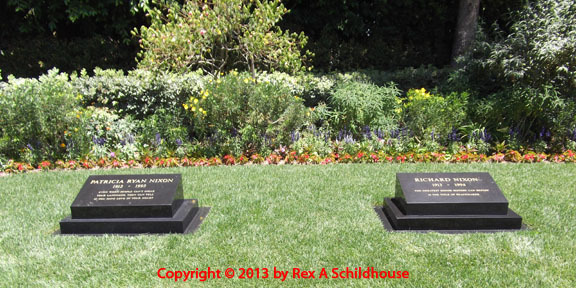 The graves of Pat and Richard Nixon. The reflecting pond at the library. 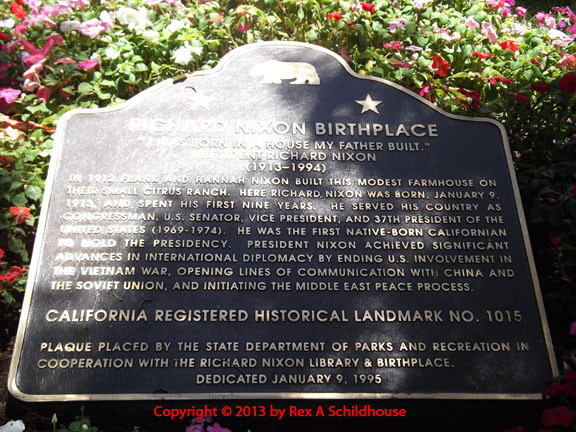 Birth house of Richard Nixon. 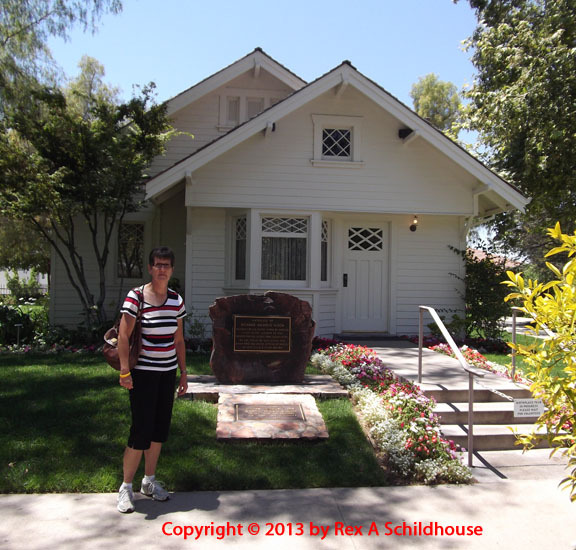 Joyce and the birth house of Richard Nixon. 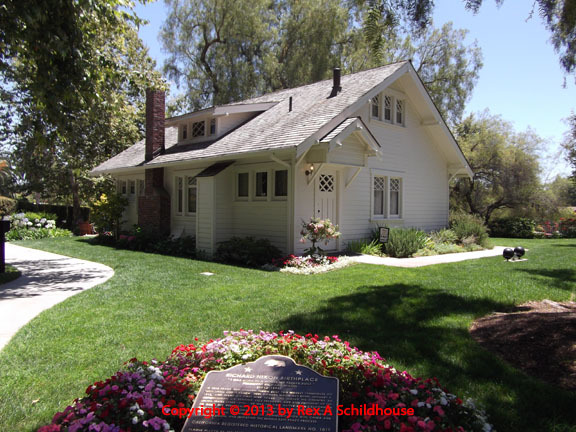 The birth house of Richard Nixon. 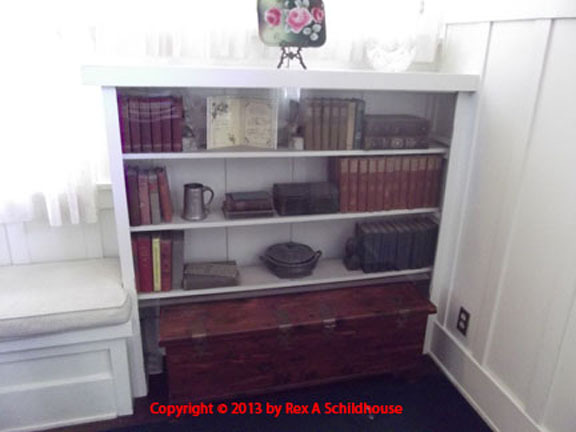 Nixon's bookcase in the living room. 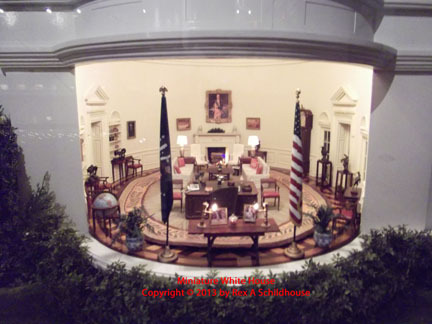 Nixon's dining area in the living room. 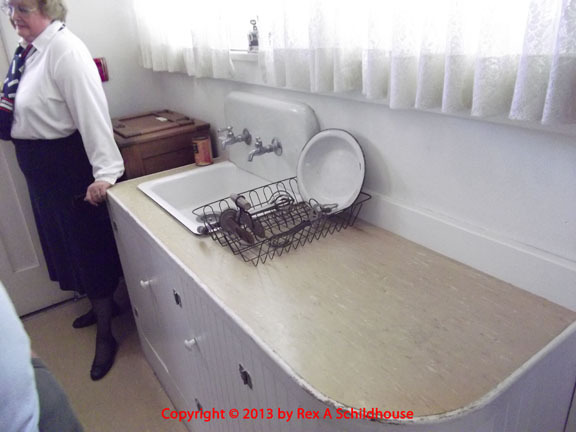 The kitchen of the Nixon home. 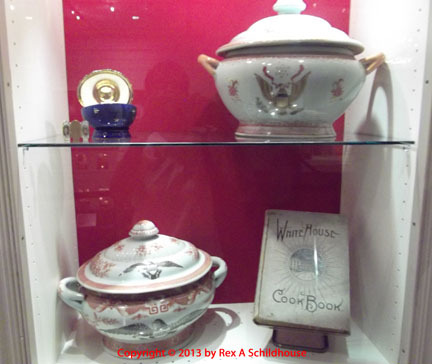 The pantry of the Nixon home. 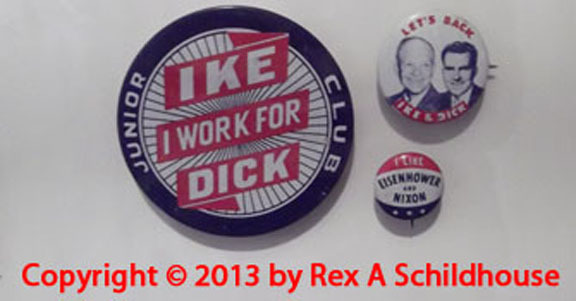 The Eisenhower / Nixon presidential campaign. 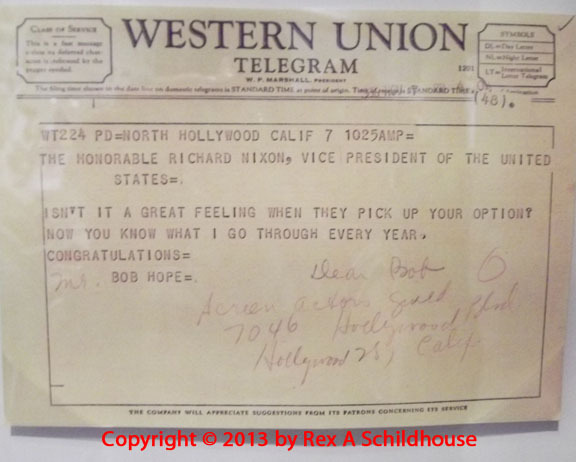 A telegram from Bob Hope congratulating Nixon on the vice presidential win. 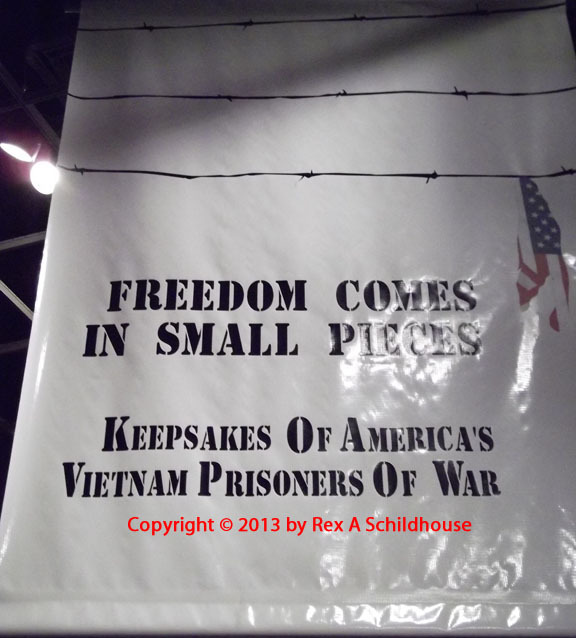 The Vietnam War Prisoners of War come home due to Richard Nixon's efforts. 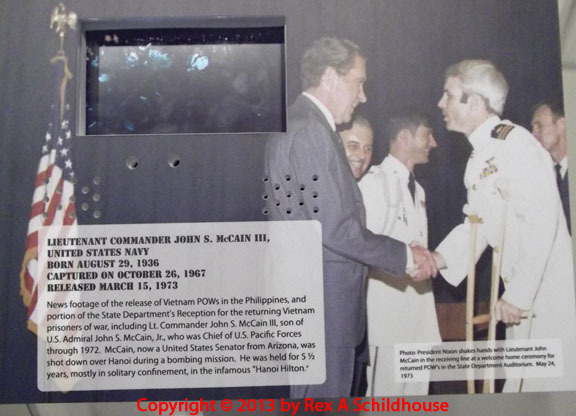 LCDR John McCain III, later U.S. Senator. LT Robert J. Flynn, U.S. Navy, VA-196, captured August 21, 1967 and released March 15, 1973. LT Ross Randle Terry, U.S. Navy, captured October 9, 1966, released March 4, 1973. I believe this rosary was made by LT Ross Terry. 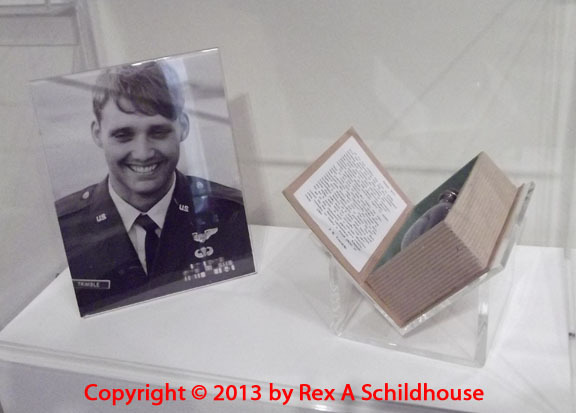 1st Lieutenant Jack Trimble, U.S. Air Force, captured December 27, 1972, released March 29, 1973. At Cu Loc Prison, known as the Zoo, in early 1973 the prisoners in the Pig Sty fashioned smoking pipes out of clay from recently made bomb craters. By rubbing the smoothed surface with pieces of bamboo one was able to create a glazed, almost glossy surface on the pipes. Designs ranged from simple to quite complex. 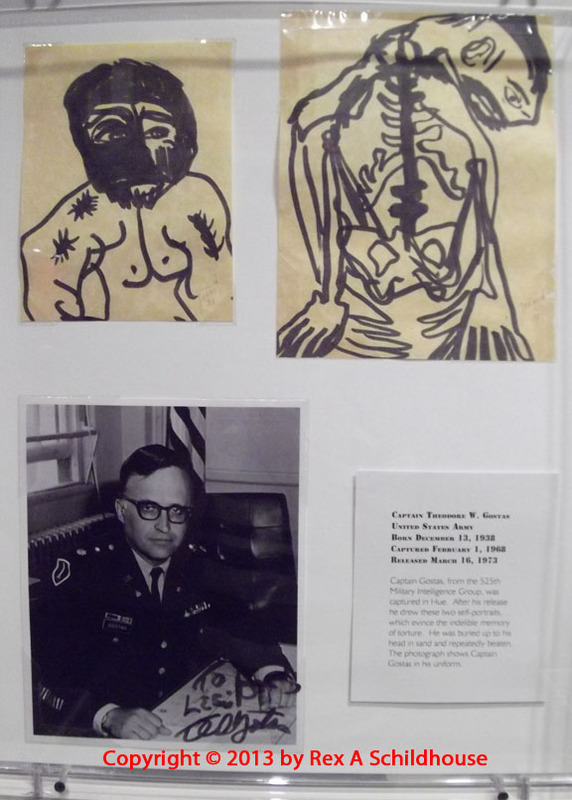 Captain Theodore W. Gostas, U.S. Army, captured February 1, 1968, released March 16, 1973. 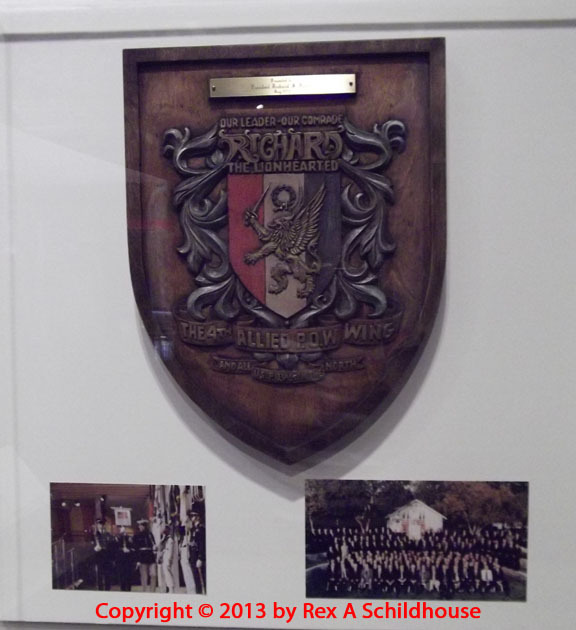 Brigadier General John P. Flynn, USAF, presented this plaque to President Nixon during a dinner honoring Vietnam POWs in May 1973. 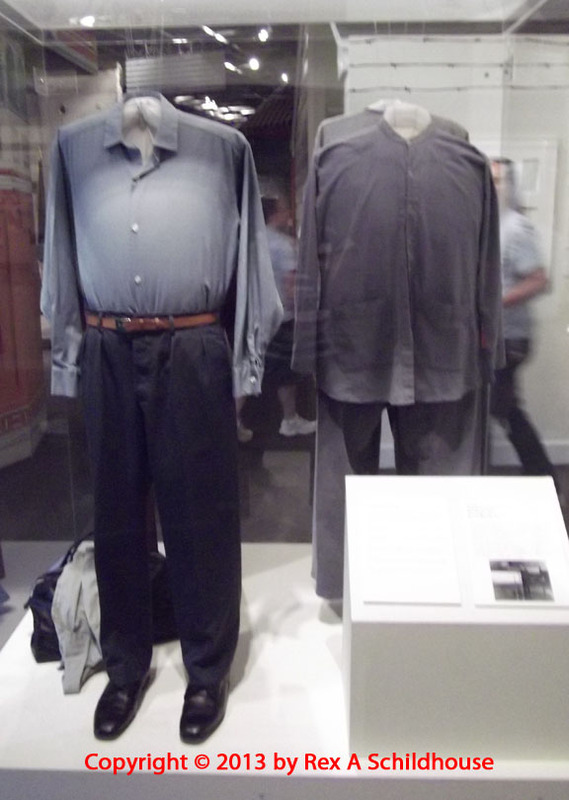 The Homecoming clothes issued for the release. This brick is from the wall of the Hoa Lo Prison, Hanoi Hilton. 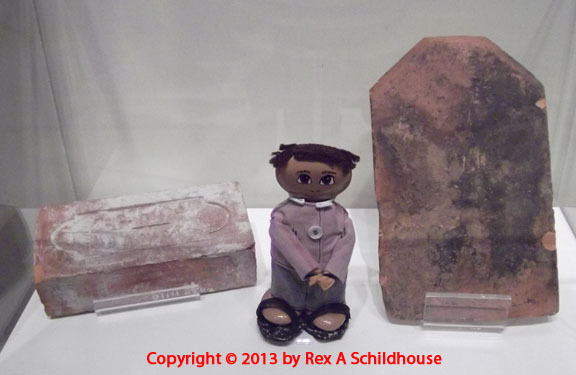 The roof tile fragment is from the Nga Tu So Prison, The Zoo. 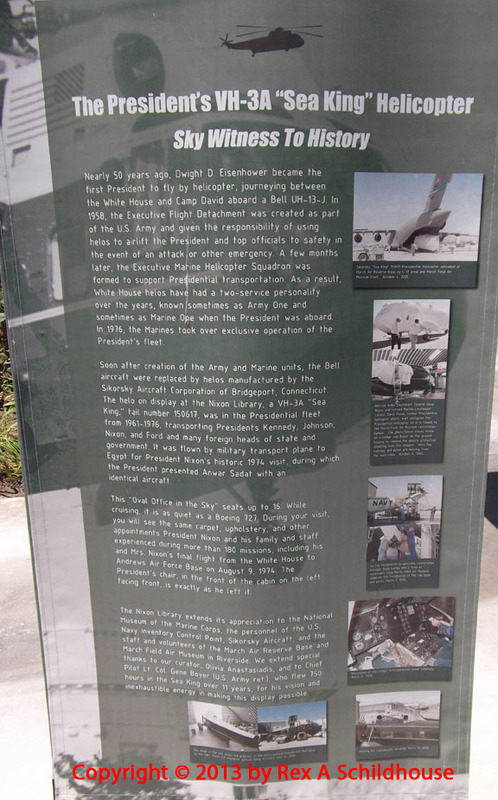 Both were brought out by Captain Nguyen of the South Vietnam Air Force. On May 24, 1973, there was a White House dinner for Vietnam POWs. 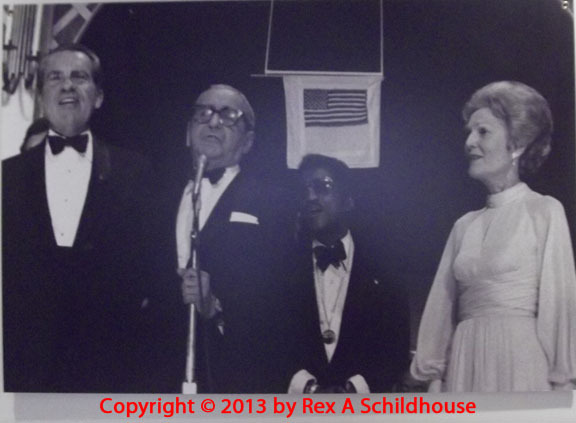 President Nixon, Irving Berlin, Sammy Davis, Jr., and Mrs. Nixon are singing God Bless America. Behind them is a U.S. Flag made by a POW during his imprisonment. POW Homecoming at the White House. 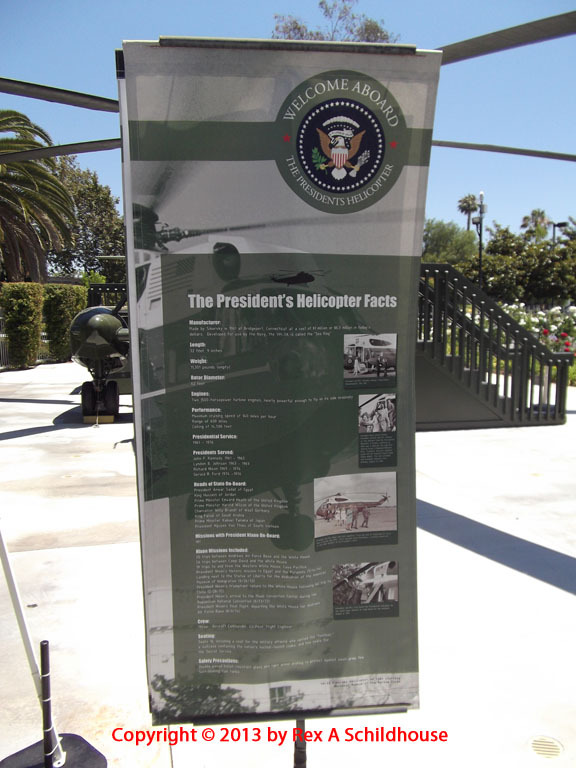 I believe this is one of the receptions to honor the returning Vietnam POWs. 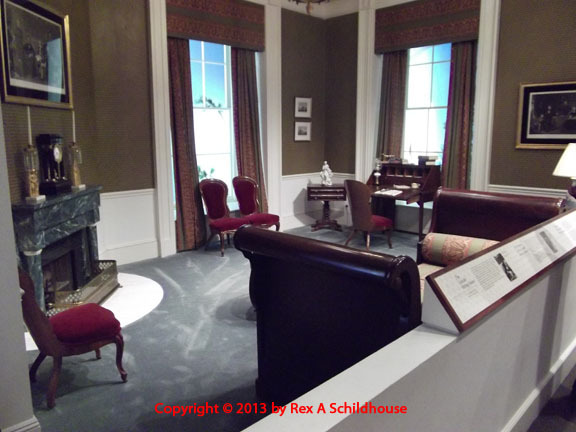 Replica of the Lincoln Sitting Room of the White House. 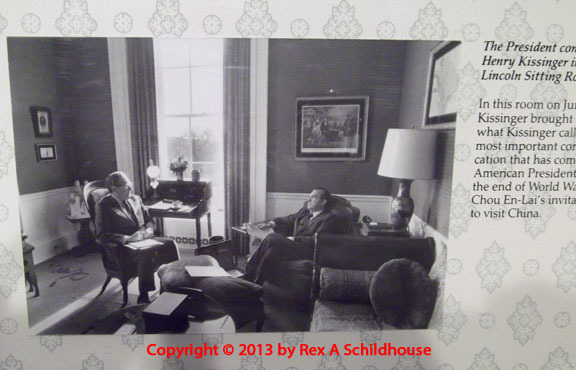 President Nixon with Secretary of State Henry Kissinger in the Lincoln Sitting Room. Back to the White House Stuff. 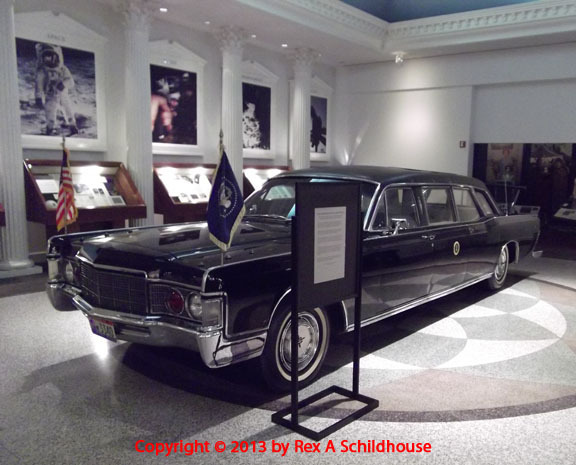 President Nixon was a very global president and either traveled there himself or sent the appropriate delegation. 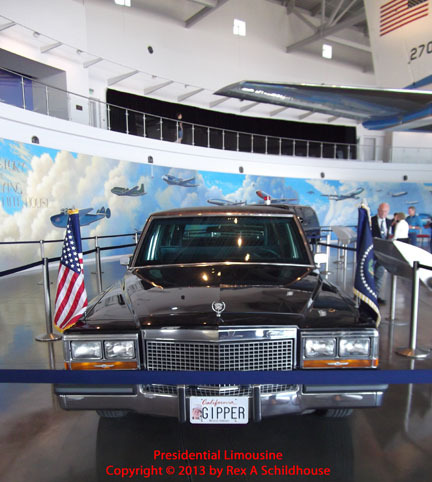 This Lincoln Continental served three presidents before being retired. 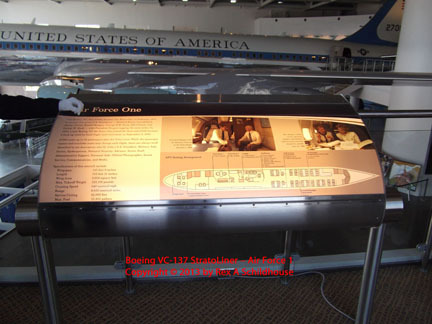 It was used by JFK for a few months and by Jerry Ford for several months. 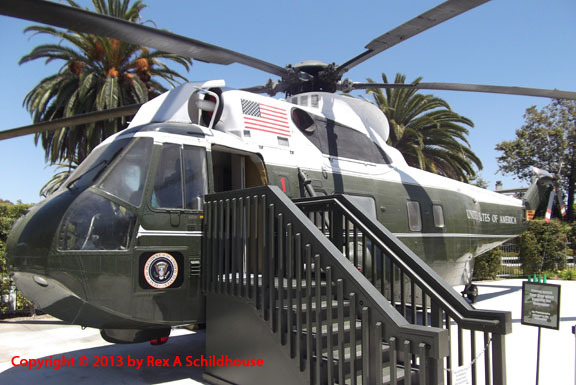 Whatever U.S. Military Service plane the president flies it, it is that service and "1." 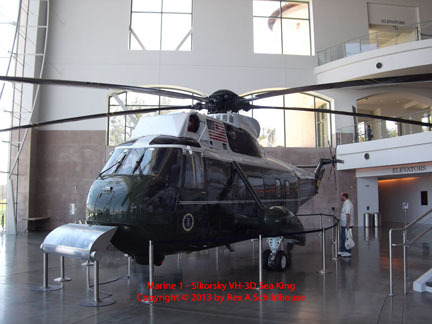 This Sikorsky VH-3 was flown as Marine 1. 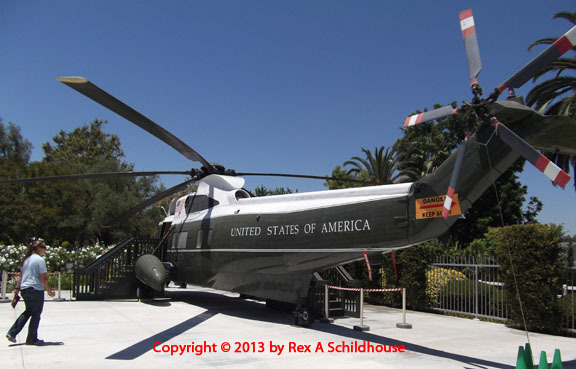 The Sikorsky VH-3 is a large twin-engine helicopter flown by the Marines. 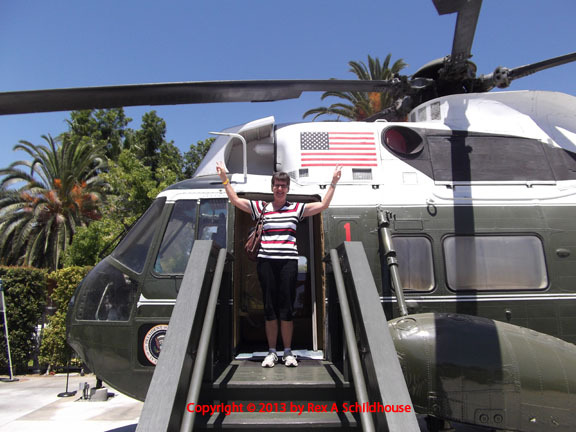 Cindi approaching Marine 1 on a mission. Now we are done. Back to work. 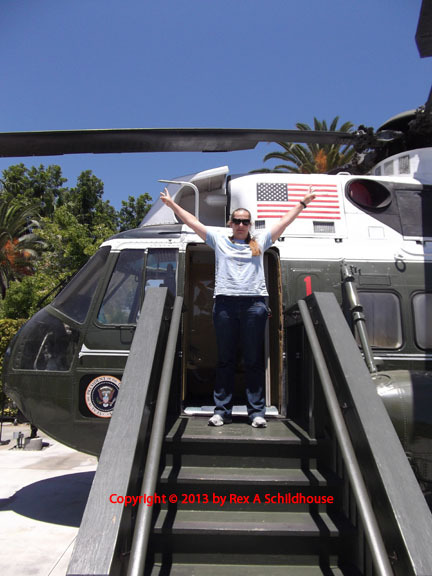 I have a lot of riding time in the Sikorsky H-3 in the Navy CH-3 and SH-3 models. Its size has ALWAYS impressed me. Breaking the flow slightly. There were several events after the election in 1968. The Nixon's youngest daughter, Julie, married the grandson of Dwight D. Eisenhower in New York on December 22, 1968, after the election and before the inauguration. 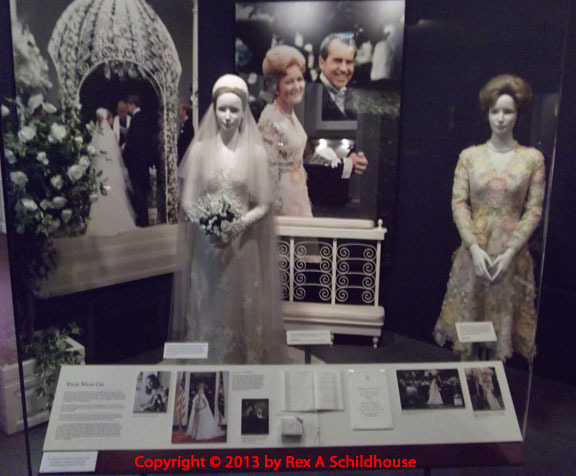 Patricia "Tricia" Nixon, the oldest daughter, married Edward Finch Cox in a White House ceremony on June 12, 1971. 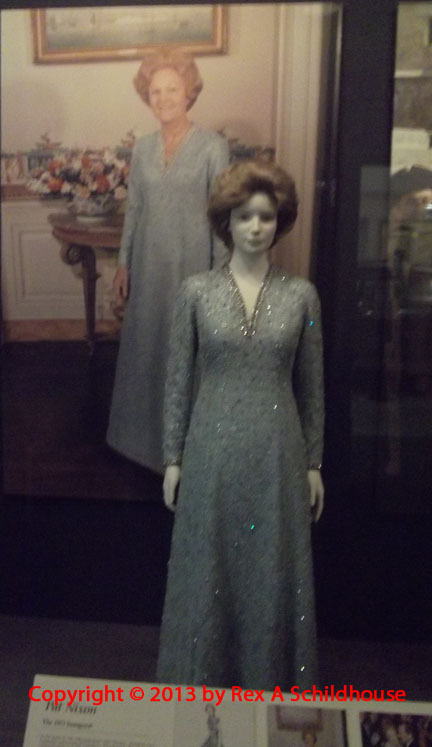 I believe this is the 1973 inaugural dress. Tricia Nixon marries Edward Cox at the White House. 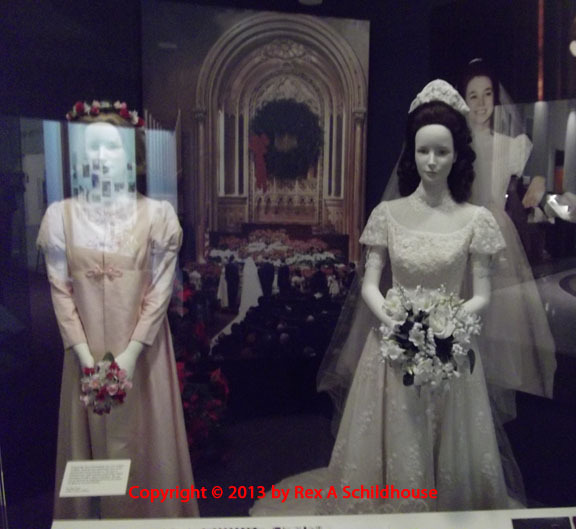 This is the wedding of Julie Nixon and David Eisenhower in New York. President Nixon's years in office were progress years for NASA. 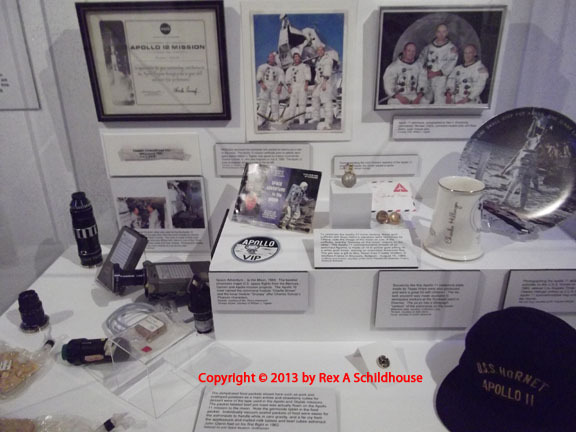 The first walk on the moon and many other successes. 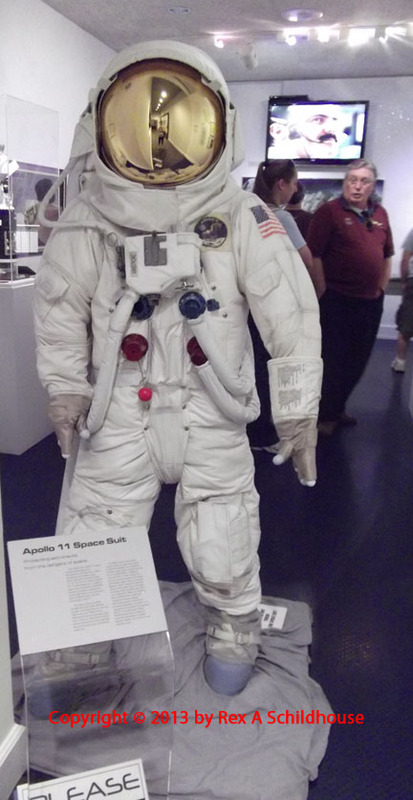 This suit is an Apollo 11 suit. Notice how big and bulky it is, improvements will be made. Cindi and I are in the background. 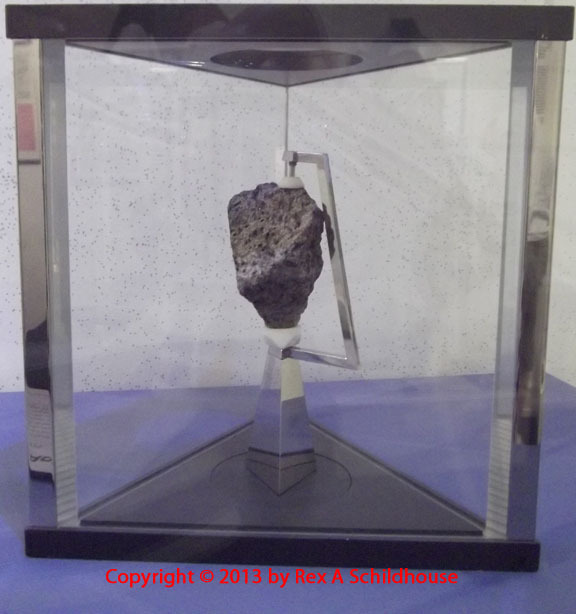 Space memorabilia from Apollo 12. 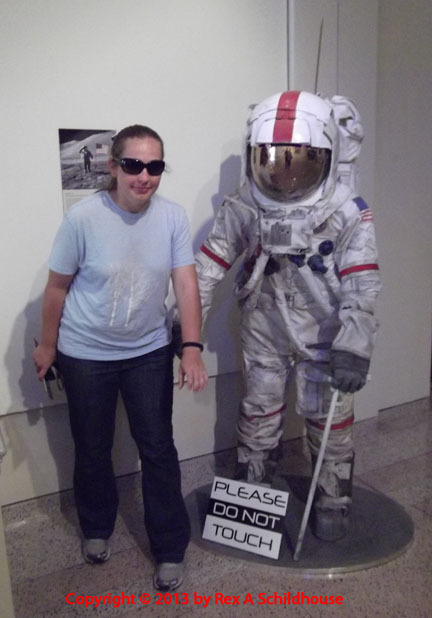 Cindi is mocking the Apollo 16 astronaut in the newer, lighter, space suit. With the broad red stripe this is a replica of the suit the mission commander. 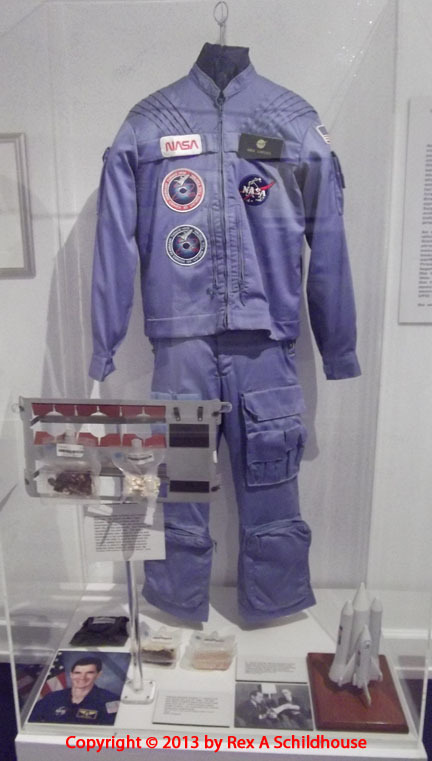 While the space shuttle astronauts wear a pressure type space suit during take off and landing, they can spend a lot of their flight time in a "leisure suit" such as this one. This is one document that speaks for itself for those of us who lived through it. 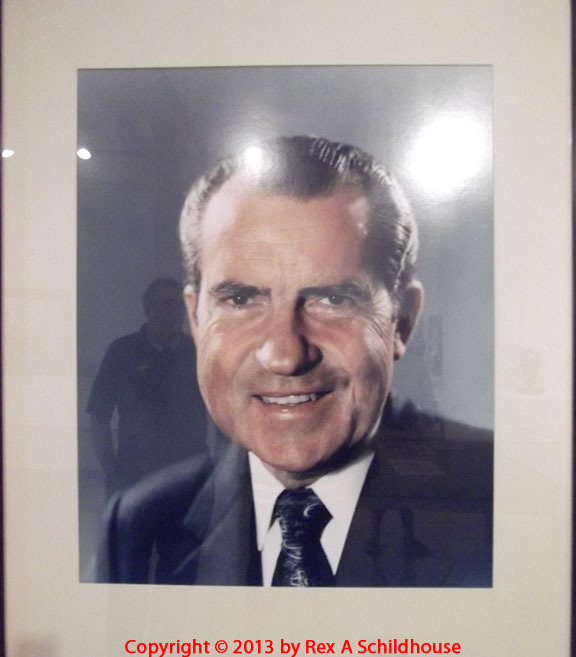 The many major successes of President Nixon will forever be overshadowed by one mistake. Just an interesting keepsake for his years of service. 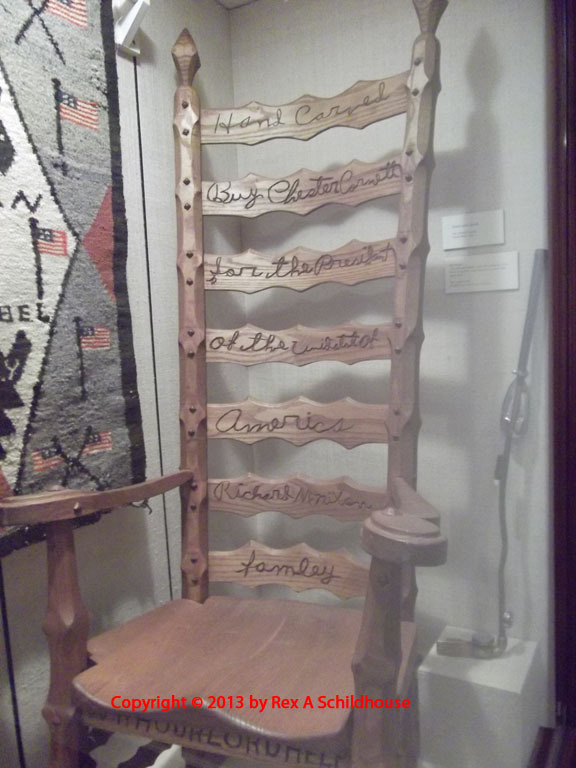 A hand-carved chair. 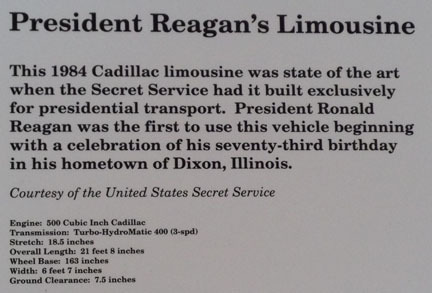 President resided in Park Ridge, New Jersey for a period of time. Here is his study as it was in 1994. Banquet Room at the Library and Museum. 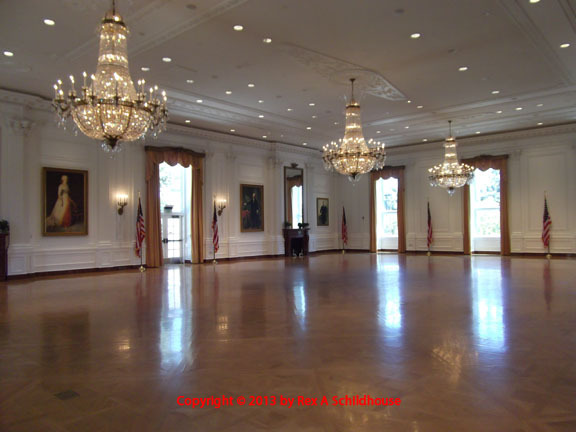 This is one beautiful room and it is available for special events such as banquets and weddings. President Nixon has numerous "ordinary man" quotes. 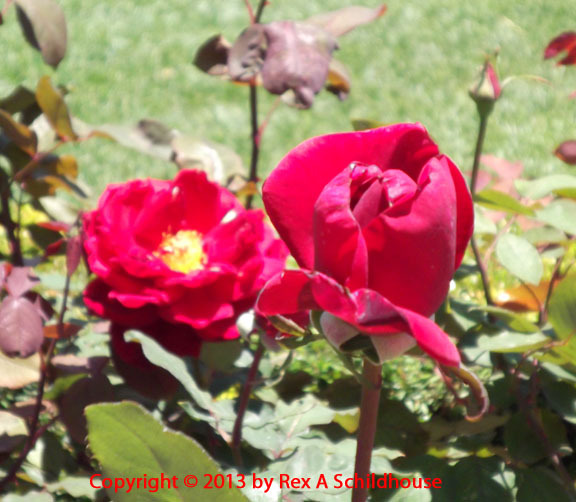 Flowers at the Nixon Presidential Library and Museum. I am not much of a flower person but the flower presentation at the library and museum just hit me. Here are some of them. 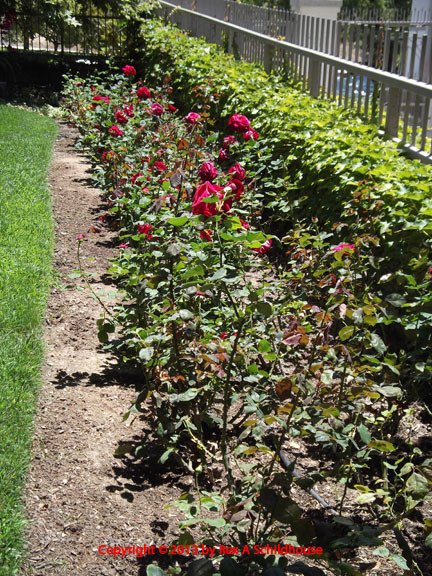 In this group are two species of interest, Mister Lincoln Tea Roses and Pat Nixon Roses. 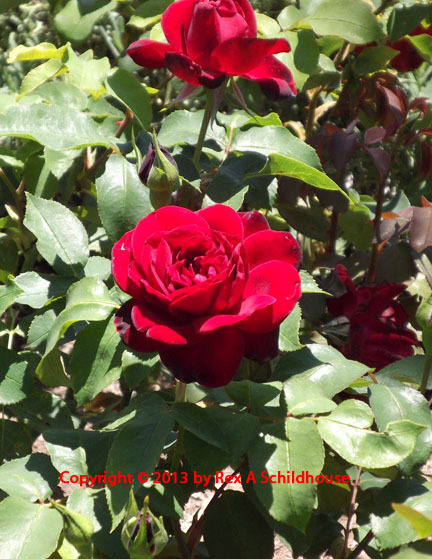 This may be a "Pat Nixon Rose" by species name. 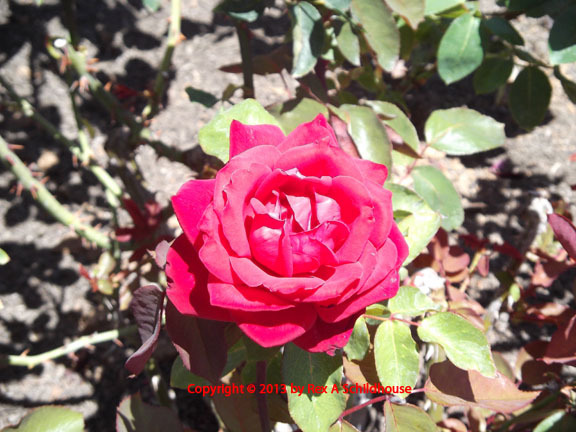 This may be a Mister Lincoln Tea Rose. 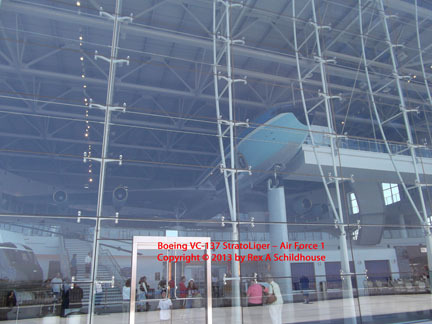 Admission fee, check the museum homepage for current prices. This museum is an operating museum hidden and not well advertised. We found out about it from Bas, one of my bosses. 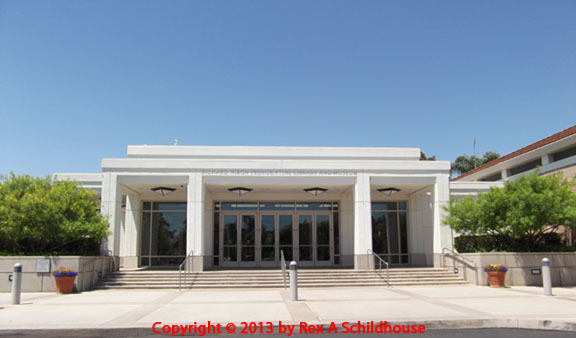 It is at 2040 North Santa Fe Avenue in Vista, California 92083, phone (760) 941-1791 and (800) 587-2286. The homepage is http://www.agsem.com/. On our trip we spent about 3 1/2 hours there and took over 300 photos and about 10 videos totalling almost 45 minutes. a couple of the museum's personnel has some of the gas engines running. 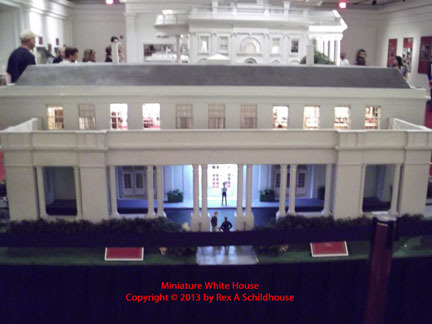 The displays include a rather large N gauge operating model railroad. Lawn mowers and tractors in numerous states of disrepair. Steam powered tractors from the late 1800s into the 1900s. Oil powered / steam tractors for their short life in the early 1900s. Gas powered tractors from the start of gas powered tractors up to the 1960s. Gas and Diesel powered trucks from the 1920s to the 1970s. Several very well restored and operating. Numerous pieces of equipment that had no other home and found one here. Some are pretty cool to see. All sorts of steam / coal, steam / oil, gas, and diesel fueled engines. Many are operational. 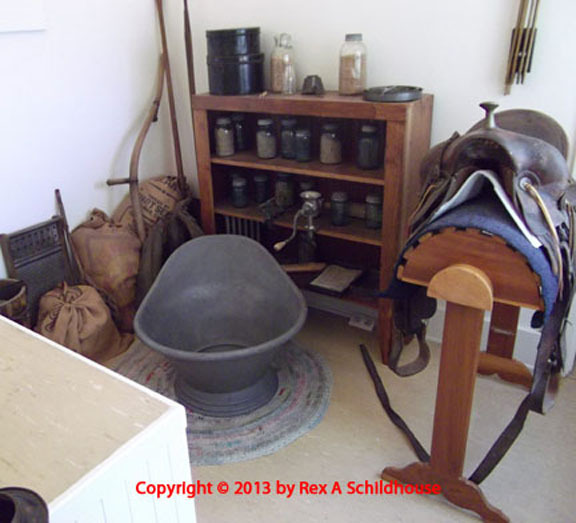 The pictures provided here are a sampling of the museum. 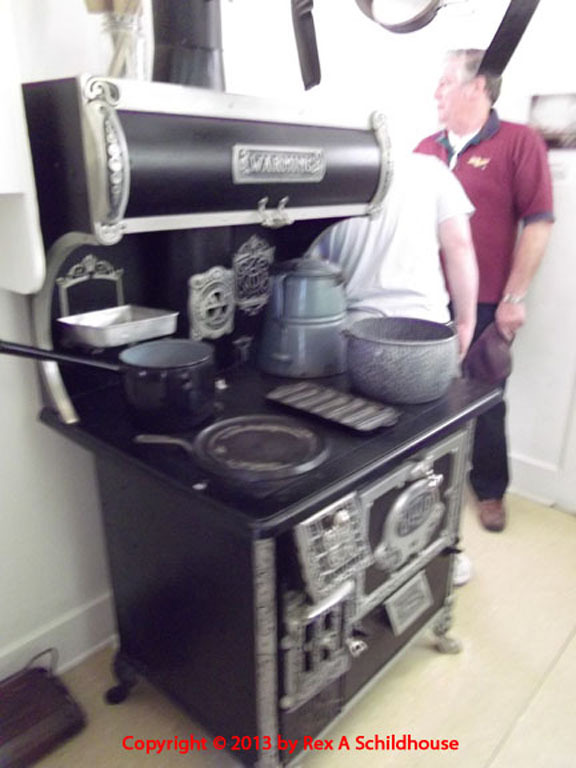 The Vilter Refrigeration System was built in 1910 with a 12" bore with a 24" stroke and a 10' diameter flywheel. This system provided the cooling for wine from 1910 until the late 1950s in Guasti, California. It is a two piston system. One piston converts the steam to horizontal motion which the rods and a crankshaft convert to rotary motion. The second piston takes the rotary motion and through rods and a crankshaft converts the rotary motion into linear motion which compresses the ammonia refrigeration compound. This is the piston from the Vilter Refrigeration System. 12" in diameter and hemispheric to increase compression. The 1910 Allis-Chalmers Corliss Engine was used in the Santa Ana, California beet fields until 1978, long after the beet fields left. It weights 80,000 pounds, the 12' diameter flywheel alone weighs 18,000 pounds. It has a 20" diameter cylinder with a 36" stroke and operates at 80 RPM. The Ideal Ajax horizontal steam engine was used in the oil fields of Huntington Beach, California. This engine has a 12" bore with a 12" stroke and one 44" diameter and one 30" diameter flywheel. At 100 PSI steam pressure and 100 RPM this engine produced 60 horsepower. Greenfield Electrical Generation Station - Kind of neat. E.H. Wachs Vertical Steam engine. This engine was purchased new for $150 after being made in Chicago, Illinois in 1914. With a 7" bore and 7" stroke. This is the diagram that explains how a boiler system works. The gases from the fire pass through the tubes and transfer heat energy to the surrounding water turning it into steam. Overheating or under water level can melt the tubes resulting in an explosion. This is one of MANY steam tractors on display. Twice a year these run around the museum. I have shown the intense gearing to move the tractor, its interesting steering system and some of its valves and controls. Steering gear in detail on a Case steam tractor. This is an 1897 Case Mancy steam tractor that produces 12 horsepower. Russell Steam Tractor. The same steering gear is visible. International 8-16 Oiler Burner - They say this burns oil to produce steam. This is another unidentified oil burning tractor - BIG. This is part of the MANY outdoors exhibits. Rows and rows of equipment in various conditions. The grey unit is a Case and the green is a John Deere. This is a 1927 McCormick-Deering Model 10-20 Tractor. Minneapolis-Moline Model R "Visionlined." This were made from 1939 through 1955 with 23 - 27 horsepower. There a TONS of John Deere tractors on display and most appear to be operational. This is identified as a 1945 Model B International McCormick Farmall. With a 3" bore and 4" stroke on its four cylinders it produces 16 horsepower. Massey-Harris Four Wheel Drive Tractor. There are a lot of gears in this system and it has a high clearance with the wheel gearing like it is. This is an unknown make but interesting construction. Really nice restoration to operational status of a 1950s(?) Farmall. Allis-Chalmers Model G. Small general purpose and light duty tractor. Allis-Chalmers Model G. From the era of 1948~1955 this is a 10 horsepower, 1,500 pound tractor powered by an AN-62 four cylinder gas engine. 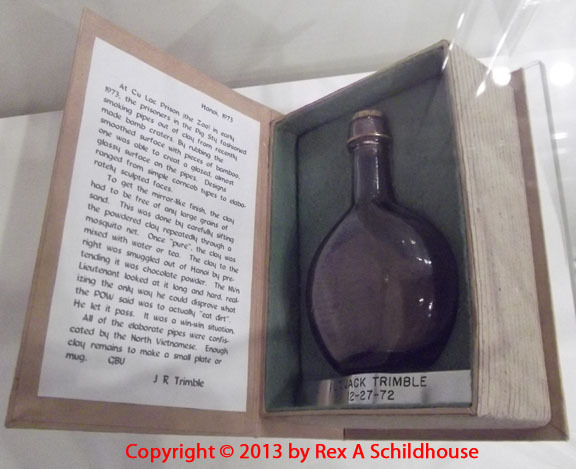 One of the many items in the museum I would love to take home and play with. 1954 Tucker Sno-Cat. Not the Tucker Car Guy. 1927 Mack Truck. Nice restoration. 1927 Graham Brothers "dump" truck. Interesting dump system. 1920s or early 1930s Autocar Truck. Clark Type 2 Gas Engine. Oil City Boiler Works Engine. Unknown timeframe but interesting. Compression ignition helped by a magneto. Venn-Severin two cylinder engine made in Chicago, Illinois in 1925. This Model 5680 has a 12" bore and 18" stroke with a 5' diameter flywheel producing 140 horsepower at 327 RPM. This Enterprise Engine DSW-6 was made in 1937 and provided backup electrical power at the Mount Palomar Observatory in San Diego County until 1996. This six cylinder diesel with a 10" bore and 13" stroke develops 220 horsepower at 450 RPM. This Atlas Imperial Diesel is a marine powerplant from a 120' garbage scow during WWII. With 6 cylinders, a bore of 11 1/2" and a stroke of 15" this 9,348 cubic inch displacement engine develops 300 horsepower. John Deere planter to be towed behind a team of horses. 1917 Holt Hillside Combined Harvester. With its 24' header cutting the grain this unit could remain on flat ground while being pulled by 24 OR MORE HORSES and harvest and separate, then bale the crop on the hillside. Some were built with 50' headers! ONE BIG MACHINE! Wayne 1920s Model 89 and Bennett Model 383 1940s gas pumps. There are numerous wagons of various configurations around the museum. 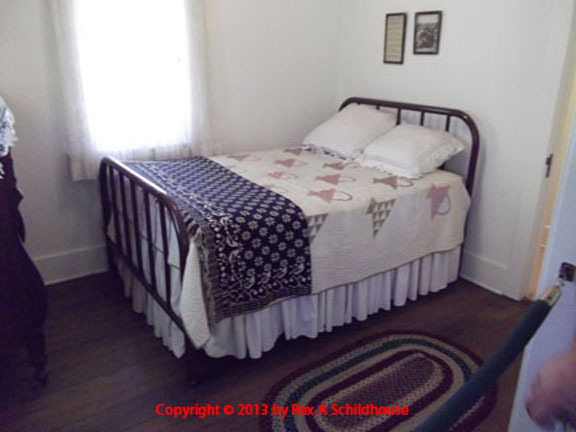 This is one of the buckboards. Power Shaft Band Saw. At one time it was not uncommon to have a single powered shaft running through the overhead of the shop. Then belts would be attached to operate various equipment. This is a LARGE band saw powered by a belt from a power shaft. Power Shaft Powered Drill Press in the museum's operating workshop. Changes in pulley size changed the operating speeds. 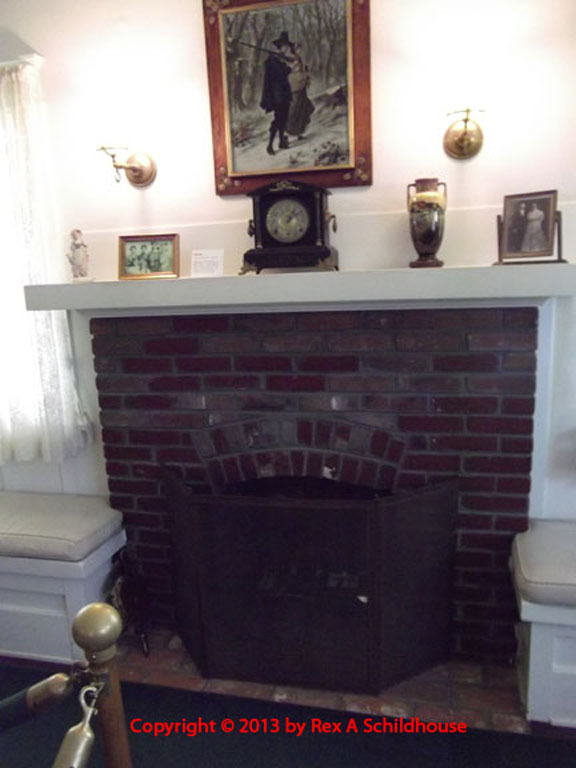 The museum has constructed or restored a classroom. Kind of interesting. 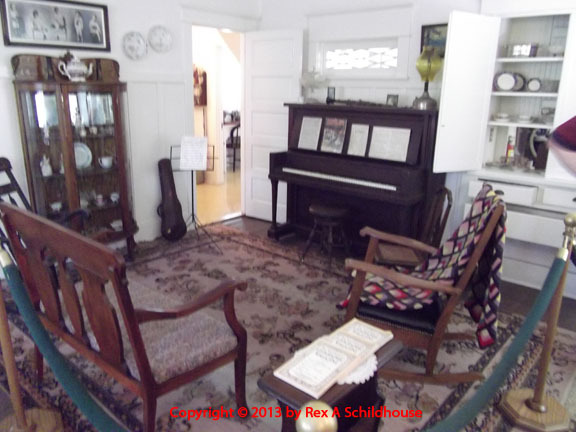 The Museum also either built a "farm house" and structured it with several rooms in one. There is one building on the grounds of the museum dedicated to looms and many are operating. When we visited several people were working with some of them. Actually very interesting. I had never seen the gearing that changes the loom's "lifts" creating patterns before. George S. Patton, Jr. was born in San Gabriel, California on November 11, 1885. Patton died on December 21, 1945, as the result of an “interesting” auto accident in Bad Nauheim, Germany on December 9, 1945. I have read some interesting opinions on that in Killing Patton by Bill O’Reilly and Martin Dugard, reviewed in the Book Reviews. In reference to several books and articles on Patton his goal from Day 1 was to become a hero and remembered as a subject in history. To those goals the body of George S. Patton, Jr. lays in Europe due to regulation in affect at the time of his death. General Patton lays in a grave with his Men lost in combat in American Military Cemetery in Hamm, Luxembourg while his soul lives in Heaven knowing he was successful in his life. The American Military Cemetery in Luxembourg is where his 3rd Army Soldiers lost during the Battle of the Bulge, 1944-1945 are buried. In the Battle of the Bulge General Patton’s 3rd Army came to the relief of my Father with the 101st Airborne at Bastogne. Patton’s ancestors fought in the American Revolutionary War, the Mexican-American War, and the (Un)Civil War. After one year at the Virginia Military Institute he continued his education at the U.S. Military Academy, West Point, and graduated with a commission as a second lieutenant in the 15th Cavalry Regiment on June 11, 1909. On May 26, 1910, Patton married Beatrice Ayer. He met and dated Beatrice while attending West Point. Beatrice was an heir to an industrialist from Massachusetts. Both George and Beatrice enjoyed many of the same activities through their life and had three children, Beatrice (1911 - 1952), Ruth (1915 - 1993), and George (1924 - 2004). Beatrice would support and protect her Georgie through her life. With Georgie’s body in the American Military Cemetery in Luxembourg regulations precluded Beatrice being buried next to him. The family solution was to have their Mother cremated and they spread her ashes over General Patton’s grave shortly after her death. 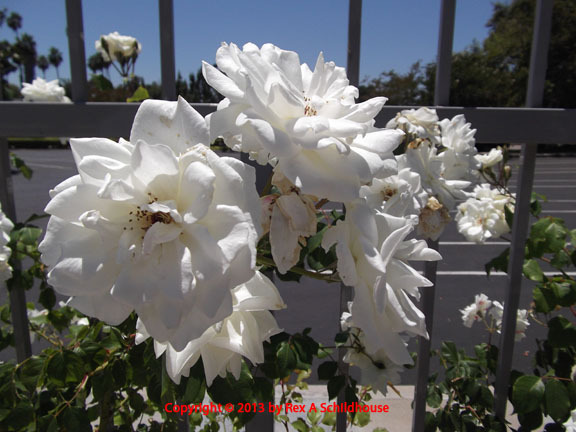 The two remained bonded through life and into death. In 1912 Patton participated in the Stockholm Olympics representing the U.S. in the first Modern Pentathlon. Patton, at the age of 26, participated in the 25 meter pistol shooting, sword fencing, a 300 meter free style swim, 800 meters horseback riding, and a 4-kilometer cross country run. With a dispute about his points using a .38 caliber revolver in the shooting portion Patton placed fifth overall in the competition. Patton chose the weapon that cost him the points based on his military background, a .38, rather than the standard target pistol of .22 caliber. Personality and pride may have cost him an Olympic medal. Following an assignment to the French Cavalry School where he also studied French sword drills and the language, a language his Beatrice was fluent in, Patton received orders to the Mounted Service School in Fort Riley, Kansas in 1913. A task manager and goal oriented, Patton became the first “Master of the Sword” where he formed and taught a swordsmanship course while he was a student. As a junior officer Patton fought the Mexican rebel Francisco "Pancho" Villa in 1915 with General John J. Pershing. In this action it is believed he mounted a machine gun to a company car and the press took notice of him for his actions and personality. General Pershing promoted him in recognition of his accomplishments to the rank of captain. The War to End All Wars, the Great War, commenced in 1914. The British commenced a secret weapons program under the cover of making water vehicles, referred to as “tanks.” The new invention utilized by all participating countries in WWI was often misconstructed, misused, mislead, inappropriately armed, and under appreciated. Patton became the first member of the new United States Tank Corps in 1917 where he remained until the unit was abolished in 1920. To fit his personality and leadership style of being in front and visible he took full command using his ideas, procedures, and tactics as well as designing their uniforms. With British tank units Patton and his men achieved victory in the first major tank battle in history at Cambrai, France in 1917. With his firsthand experience and knowledge of tanks, their uses, their shortcomings, their advantages, Patton organized the American tank school in Bourg, France. With training and confidence he took 345 of the 500 trained tank crewmen into the Meuse-Argonne Operation in September of 1918. Personality and leadership, again, allowed Patton to be at the front of his corps while using runners and carrier pigeons for communications. 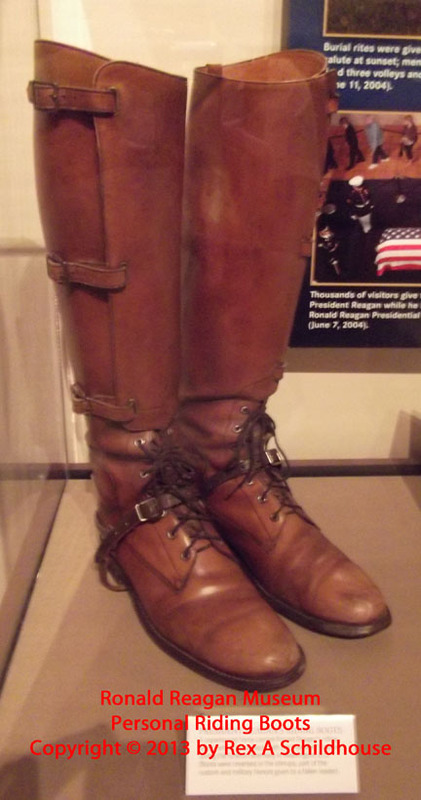 This position resulted in a gunfire wound to his leg that did not end his enthusiasm and believe in leadership by example or leadership from the lead. His efforts at Meuse-Argonne earned him the Distinguished Service Cross for Heroism. With a variety of assignments including Hawaii and Washington, D.C. Patton continued his military professional education at the Army’s Command and General Staff School in 1924 and then the Army’s War College in 1932 where he graduated with distinction in 1932. With the Nazi / German offensive actions utilizing fast moving and well deployed tanks as part of the Blitzkrieg war concept congress finally yields to Patton’s request for funding and authorized an armored fighting force for the U.S. Military. In 1940 Patton was transferred to the Second Armored Division at Fort Benning, Georgia with the position of commanding general in early 1941. Personality and leadership style dictated an amphitheater be constructed so he could address his entire division at one time. With this it is documented that he began in “Blood and Guts” speeches. About this same time he appeared on the cover of Life magazine, probably one of the most read magazines of the U.S. if not the world at that time. With the Japanese surprise attack on Pearl Harbor, which initiated the U.S. declaration of war on Japan, Germany, an ally of Japan, declared war on the U.S., the United States of America had officially entered a two front war – the Pacific Theater of Operations and the European Theater of Operations. Commanding the Western Task Force Patton lead the only all American force landing in North Africa with Operation Torch in November of 1942. Preparation for this effort was it goal of the Desert Training Center in the Mojave Desert of Southern California. The Desert Training Center, centered on Chiriaco Summit, California, with Camp Young, trained over one million men before being disestablished by the Army. This is the location of the General Patton Memorial Museum today. With his success in North Africa Patton led Seventh Army into Sicily in July of 1943. Pitted against British Eighth Army led by Montgomery as an ally and against combined Italian and German troops Patton defeated both friend and foe on that Mediterranean Island. While Germans, Italians, and Montgomery could not defeat him, he allowed the press to defeat him when he slapped a “shell shocked” or “battle fatigued” soldier in a military medical facility. Relegated to “the back of the battle,” the general most feared by Hitler and the military command of Germany Patton led the Seventh Army, a deception unit of balloon tanks, trucks, and Jeeps, until 1944, when he was given command of the Third Army in France. Patton, retaining his “we take ground, we do not hold it” concept of operations ran across Europe exploiting German weaknesses with great success. Combat actions covered more than 600 miles across France, Belgium, Luxembourg, Germany, Austria and Czechoslovakia. These efforts included the drive to relieve the 101st Airborne surrounded by German forces in Bastogne. A drive from France that only Patton said could be accomplished on the self-imposed time line. According to several sources, Patton instituted a policy of requiring local German civilians and captured German military to tour and work with the clean-up efforts of the German prison and forced labor camps. This slowed his pace. However, by the time the conflict in the European Theater of Operations had concluded Third Army led by General Patton had liberated over 81,500 square miles. This does not include Seventh Army accomplishments in North Africa or Sicily. Kansas has 82,278 square miles and France has 211,209. In post hostility Europe Patton was assigned command of the occupation army, the U.S. Fifteenth Army. Mostly likely a political assignment to keep him out of the U.S. and out of the war in the Pacific Theater of Operations. On December 9, 1945, General Patton was injured in an “interesting” auto accident in Bad Nauheim, Germany. He died in a U.S. Army 130th Station Hospital in Heidelberg, Germany. My Uncle John, my Dad’s twin brother, drove tanks for Patton through Europe. General Patton’s Third Army relieved my Dad’s 101st Airborne at Bastogne. Patton will be remembered for those two things and for many others. Including (paraphrased) sayings such as “We will not die for our Country, we will make the other guy die for his” and “We will not hold ground, we will take ground” as well as always seeming to carry hand guns outside his clothes. If you study the pictures, if it was a press event or a “non-threat” event, the guns were usually two chrome plated, ivory handled Colt .45 caliber (“Long Colt”) revolvers better suited for a rodeo fast draw competition than a military combat action. In combat scene photos taken in the moment, they are usually two Colt 1911 .45 ACP semi-automatic pistols. Leadership and personality of George S. Patton, Jr. was not stupid or reckless while being demanding and rewarding. The first time I saw the 1970 film “Patton” starting George C. Scott, it was running as the lead-in film for Alice’s Restaurant starting Arlo Guthrie, a film of a U.S. social faction during the last 1960s and early 1970s. Interesting placement. 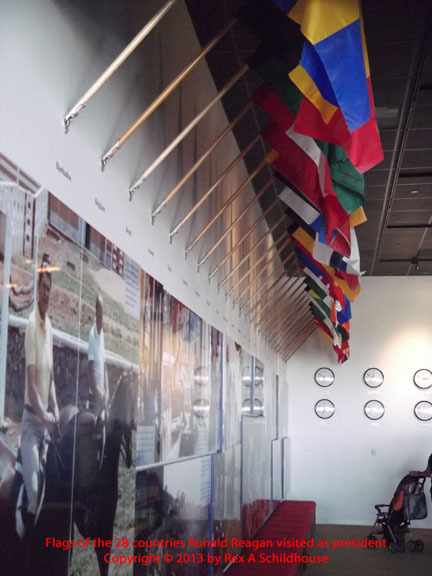 The Museum has several remembrance and appreciation walls in recognition of WWI, WWII, the Korean War, the Vietnam War, and the Defenders of Freedom prior to entering the Museum. Inside the Museum covers quite a span of time. Interesting array of military presentations, some related to Patton, most not so. Which fits into the Museum’s mission statement. Outside are numerous vehicles. 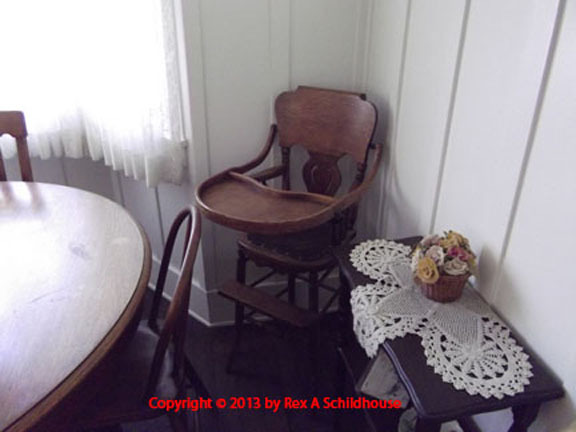 Most are presentation worthy, some are in a degree of disrepair and abandonment. 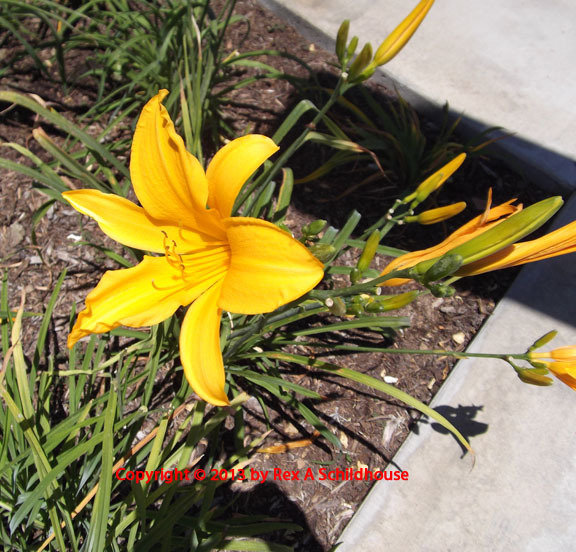 Our trip from Ramona, California took us three hours to the minute to get there and that included two short stops of about five minutes each covering 145 miles. 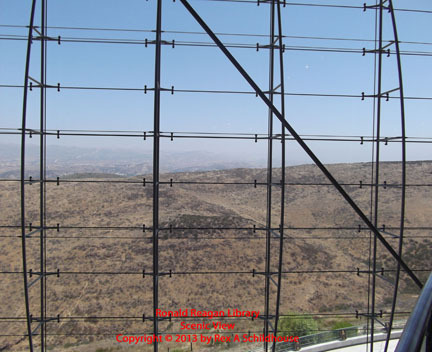 Personally, I would not recommend an out and back trip from San Diego County to the Museum. However, if planning a trip to Phoenix, Arizona I would alter my plans to take the I-10 with a planned stop of three hours at the Museum. Well worth the time spent there. Not worth the drive as a sole goal trip. The entrance to the General (George S.) Patton Memorial Museum. The Browning Automatic Rifle or "BAR." This weapon has an interesting development history paralleling the Thompson Submachine gun in many aspects. When adopted by the U.S. Military it was not sent into service in WWI in mass for fear that it would be captured and duplicated by the Germans. However, the gangsters of the Roaring Twenties had no restrictions on its use. In military service it was a fantastic weapon with some considerations of its issues. It utilized a twenty round box magazine that was fed from the bottom of the weapon. Great for open field work but bad for trench and foxhole work. It was heavy. This helped control the recoil of the .30-06 cartridge but it was a burden on the run. Beyond 200 yards it was not that accurate and regardless of range the second round fired at an automatic rate of fire was going to be up and to the right or left of the first. However, it was designed to support the infantry on the move. In that mode at automatic rates of fire the opposing force is going to duck for cover out of self-preservation when they heard the third or fourth .30-06 round fire in less than ten seconds. For the long range targets the BAR man most likely had an M1 Service Rifle (Garand) or 1903 Springfield armed soldier standing next to him. The Browning Automatic Rifle or BAR was a squad assault rifle and was superior in that role to any other weapon the U.S. Military or Allied had and was superior to many of the opposing force's squad weapons. From the top down, there is an 8 mm (0.323 caliber) 1938 Turkish Mauser. The second it the British Enfield .303 Mark III. The third is a 7.65 mm (0.311 caliber inches) French 1936 MAS. The lowest weapon is a British 9 mm Parabellum (0.355 caliber) Sten Mark II. The British Sten Gun is an interesting weapon. While the Allies had numerous auto loading cartridges, the Brits chose the 9 mm Parabellum ("to prepare for war") or "9 mm Luger" for this one. This actually gave them two supply lines for the Sten Gun. The one behind them from England and the one in front of them from German. The Sten Gun was a simple, easy to manufacture, cheap weapon. Light and dependable in the field with its small size it was an excellent weapon for close-order combat such as house clearing. Firing the 9 mm Parabellum round gave it an easy to control recoil. An often heard criticism of the Sten Gun was that it was not that accurate. How much accuracy do you need in a weapon that is designed to be used at ranges of less than thirty feet firing four or five rounds at the squeeze of the trigger? Point and shoot. The Sten Gun and the similar designed U.S. M3 "Grease Gun" submachine gun were excellent weapons for their designed purpose. 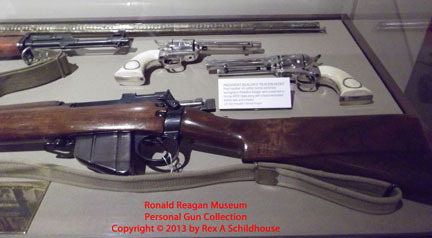 On the left panel, from the top down, the .30-06 1903 Springfield Service Rifle, the M-1 Carbine, and the M-1A1 Carbine Paratrooper issue. The Germans learned how deadly a United States Marine armed with the 1903 Springfield was during the War to End All Wars, World War I. All Marines were required to meet certain marksmanship standards before being deployed, not a standard held by many other military organizations at the time. Equipped with the highly accurate and deadly at long ranges .30-06 1903 Springfield "field Marines" became snipers in the trenches of Europe. It is believed, and supported by folklore, that this combination of a U.S. Marine and the 1903 Springfield Service Rifle is what spanned the Germans to start calling the Marines "Devil Dogs," a name earned in combat that has remained with the Corps since. The M1 Carbine is a "designed during war for war weapon." Light, easy to manufacture, small, dependable weapon. Originally designed to be issued to second echelon units such as artillery, and to confined soldiers such as tank crews, the M1 Carbine in its many versions such as the Paratrooper model and the M2, a select fire version, was the most produced Allied rifle / carbine of WWII. While the M1 .30 Caliber Service Rifle, the Garand, fired the .30-06 rifle cartridge, the M1 Carbine fired the .30 caliber carbine round. To compare the two, the .30-06 leaves the muzzle at approximately 2,950 feet per second with approximately 2,800 foot pounds of energy in its 155 grain bullet. The M1 Carbine firing the .30 Carbine round has a 110 grain bullet leaving its barrel at approximately 1,800 feet per second with approximately 880 foot pounds of energy. The M1 Carbine, like the M1 Garand, was produced by a wide variety of companies during the war. Interchangeability of parts ensured the operation of the carbine in every environment that it served in. Many criticize the M1 Carbine for being inaccurate. The Carbine is accurate out to 250 yards but loses its energy quickly over that distance. The .30-06 fired by either an M1 Garand or 1903 Springfield was accurate out to 500 yards with an expert shooter and out to 1,000 yards with as excellent shot. And at those ranges the .30-06 was still a potent weapon. The M1 Carbine, designed for rear echelon units, was assigned to front line units. It met its design criteria very well and was an affective battlefield weapon within its design limitations. Both rifles in the right side of the display are M1 Garands, technically they are the "U. S. rifle, caliber .30, M1." John Garand, a Canadian who migrated to the U.S., was a designer at the U.S. Army's Springfield Armory. His team's rifle has carried his name since its introduction to the degree that most have never even heard the rifle's correct name. The M1 Garand was first proposed using either a .256 or a .276 caliber cartridge. That proposal was rejected as it was deemed a "non-lethal round" in the weapon by such individuals as General Patton. Upgraded to the .30-06 cartridge for the review reasons and the fact that the U.S. Army had millions of .30-06 rounds in warehouses as leftovers for WWI production contracts the Springfield Armory had a rifle that Patton called "the greatest battle implement ever devised." Numerous other individuals recognized the power, strength, and dependability of the M1 Garand. The rifle served from the entry into WWII into the Vietnam War. Soldiers who carried it commented adversely about its weight - up to 11 pounds, until combat, then their comments switched to lifesaver and best battle companion ever invented. With the .30-06 cartridge the M1 Garand has an effective range more often limited by the ability of the shooter than the combination of the rifle and its cartridge. The M1 can be found today at target matches firing winning scores out to 1,000 yards utilizing the military issued peep sights. The M1 Garand had several modifications along the way. The most notable was acting as the design platform for the M-14 select fire service rifle firing the 7.62 mm NATO round. With this round effective range exceeded 1,000 yards with a slight increase. The U.S. Navy modified a number of M1s to fire the 7.62 mm NATO round to reduce the complexity of the supply chain. 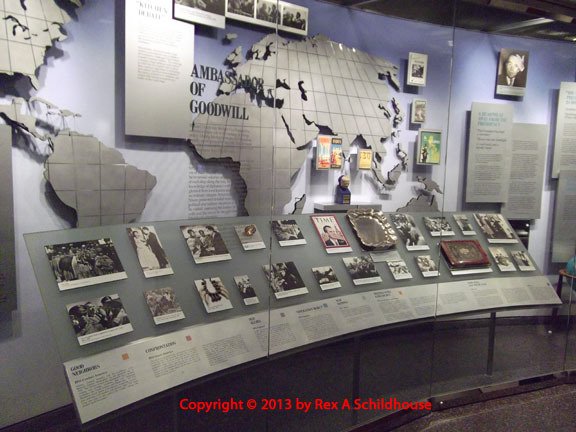 The Museum has one room dedicated to presentations and documentation of the Holocaust. Most of my pictures did not turn out due to reflections off the glass. My Father, as a member of the 101st Airborne Division, toured several of the forced labor and extermination camps as the 101st moved through Europe. If he were alive today he would argue with anyone who claims there was no such event. The Museum is heavy on weapons. Nice to view them in this presentation. The upper left and upper right are both 1911 .45 ACP Colts. The 1911 went into service in 1911 and has remained in service, with numerous modifications, since. The 1911 became a "special issue weapon" in the early 1980s when the 9 mm (0.355 caliber) Parabellum firing Beretta M9 was adopted as the standard U.S. Military sidearm. Recently the .45 ACP and the 1911 have reentered U.S. Military service due to the lack of penetrating power of the high speed, low profile 9 mm. The center is a Browning HiPower made in Belgium before and during WWII. The HiPower fires the 9 mm Parabellum cartridge from a "double-stacked" 13 round clip in the grip. This countered the 1911 Colts with their 7 round clips. For German forces during WWII the Browning HiPower was usually issued as a "recognized" officer sidearm due to cost and limited availability. The design is of such a quality that production commenced in 1935 and it is still being produced by Fabrique Nationale (FN) in Belgium. The Walther P-38, "Pistole 1938," was adopted by the German military as soon as it was proposed. Firing the, standardized by the Germans, 9 mm Parabellum cartridge for a "straight stacked" clip the P-38 has 9 rounds in its clip. Designed with simplicity and ease of production without compromising dependability the P-38 was produced from 1938 through 1945 when the surrender stopped such production. It reentered production, under license, in 1957 and remained in production until 2000. Total production efforts exceeded 1,000,000 units. While the German Luger, Pistole Parabellum 1908, is the icon of German sidearms of WWII as well as many evil movie villains, the weapon was a complex and sensitive device. It was hard to keep in field functional condition and difficult to load as "pulling the toggle" is not an easy to grip and pull as a slide was to pull back. Numerous pistols were proposed to replace it. These included the Browning HiPower, the Walther P-38, and the Walther PPK and PP series of pistols. The problem with replacing the Luger was every time a Luger was replaced, the recovered Luger was reissued. The Luger and several other German sidearms were also chambered for the smaller 7.62 mm (0.308 caliber) or .380 rounds. The .380 is also called the "9 mm short" being the same caliber, 0.355, as the 9 mm Parabellum. The M1928 was designed by a team lead by retired General John Thompson. His goal was to produce a "trench broom" weapon to address the warfare tactics occurring in Europe at the time - The War to End All Wars - WWI. The Browning Automatic Rifle (BAR), in limited use, was ill suited to the task due to the length and 20 round magazine. The Germans were successful in using the Bergmann MP 18, a man carried carbine sized submachine gun. The "Annihilator," renamed the Thompson Submachine gun and often referred to as the "Chicago Organ Grinder", "Chicago Piano", "Chicago Style", "Chicago Typewriter", "The Chopper" "Tommy Gun", "Trench Broom", "Trench Sweeper", and (simply) “The Thompson.” Developed too late to enter WWI, the Thompson entered service with the military in limited applications, the law enforcement community, and the criminal sect with limited "general public use" due to cost. With favorable comments from U.S. Marine experience the M1928 military procurement efforts commenced in earnest was the dark clouds formed over Europe in the late 1930s. Due to complex and costing manufacturing requirements the M1928 was redesigned and redesignated as the M1 Submachine Gun, a documented designation that is not often found. Due to cost and fire power the M1928 was usually issued to senior NCOs - sergeants and above, and officers unless it was a special unit. The issue was usually with 20 or 30 round stick magazines rather than the larger, heavier drum magazines of the gangster movies. My Father carried the Thompson for a time with the 101st. He thought it was a great weapon for close combat and house clearing but it made you a "valued target" in open fields. Due to its cost and production time the M1928 spanned the requirement that lead to the M3 "Grease Gun" machine guns. However, the Thompson remained active in the U.S. Military until the 1970s. The Museum has several model cases. I wish they had better spacing and were labeled identities and purpose. My closer photos are bad due to glass and paint reflections. Dog Tags - Every U.S. Soldier, Sailor, Airman, Marine, Coast Guardsman since the early 1900s has been issued "Identification Tags" better known as Dog Tags. The name "Dog Tags" goes back a ways according to documentation and comes from a number of different sources all at the same time. This photo shows a round set from William Webb, 414974 P (for Protestant) June 10, 1981." Various supplies and items a GI might have. My Father talked about "being issued" cigarettes in GI packs during his time in the Army, 1940-1945. He said you learned to smoke in the Army if you did not know when you joined because the DI would say something like "Smoke them if you have them, if you do not, police (clean up) the area. This is a field camp stove assembly. The saying that the Army moved on its stomach was deeply entrenched. It was a double meaning phrase but it stressed that well fed soldiers fought better than ill fed and starving soldiers. The U.S. Government put a lot of effort into getting good, quality food into the GI. This is just one of the efforts made to attain that goal. Spam was one of the food efforts to feed the troops in the field during WWII. Beer in metal cans and the P-38 can opener were other efforts. Not good if you have the canned food and cannot open it. The M4 Sherman Tank with the driver standing in the open turret hatch. A replica of the "business" end of a Chapel at Camp Young. The M4 Sherman tank is the vision of the Allied tank during WWII. Officially designated a medium tank due to its 75 mm or 76 mm main gun the Sherman was the most produced U.S. tank in the war with over 49,000 coming out of many U.S. factories. The M4 Sherman’s list of manufacturers does not include the many subcontractors and is not nearly as long as the users of this weapons system. The M4 Sherman program had some goals at the start – mechanical reliability, ease of production, ease of maintenance, durability, standards / interchangeability of parts, and a common ammunition requirement. To these goals the M4 Sherman excelled. Damaged or destroyed Shermans were often scavenged for needed parts if not repaired in rear echelon depots. The gyrostabilizer attached to the main gun allowed the Sherman to fire on the move with reasonable accuracy utilizing the benefits of a fully traversing turret. In combat in North Africa in 1942 under General Patton the M4 Sherman proved to be more than a match for the German Panzer III and IV tanks as well as any random Italian tanks it came across. These Panzers were mounting 50 mm and 75 mm guns respectively. 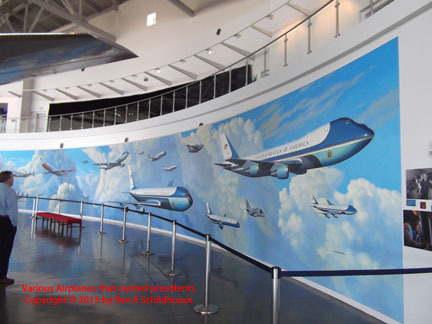 This gave the U.S. ordnance development team a feeling so security and satisfaction with their design work. With the size and weight of the Sherman the Allies had a tank that could traverse any road and cross most bridges on the continent of Europe. The basic M4 chassis was also the core of various tank destroyer vehicles which utilized an open turret with a more lethal, higher velocity main gun. Coupled in force with Shermans, tank destroyers, towed anti-tank weapons, and fighter/bomber aircraft flying anti-tank missions the Allies were often victorious in armored battles due to sheer numbers and dependability. In the Pacific Theater of Operations the M4 Sherman was usually the dominate tank in any engagement with Japanese armor. You will see it in many WWII themed movies utilizing a flame thrower system affixed to its main gun as it was being used against entrenched infantry and concealed snipers rather than the tank-to-tank actions of the European Theater of Operations. Due to availability, cost, and dependability M4 Shermans were often assigned directly to infantry units as support simplifying the chain of command in significantly increasing the responsiveness of the armored units. With the support and appreciation of the infantry the M4 Sherman remained in service through the Korean War and was finally retired by the U.S. Military in 1955. However, the M4 chassis continued to serve in other roles including tank destroyer, mobile artillery, and tank retriever. Many foreign governments operated the M4 Sherman through the years. 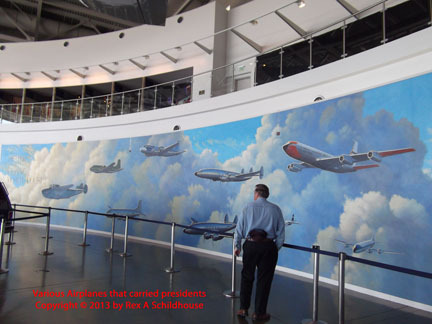 As it left military service many fell to collectors and museums. Even today it is relatively easy to find a collector who regularly operates his M4 Sherman for special events. Part of this is because, while a tank may weigh in excess of 30 or 60 tons, its pounds per square inch on the ground is often less than a deuce and a half truck or standard car. The tracks distribute its high weight over much greater area than the four tires of a car of ten tires of most trucks. Length approximately 19 feet 2 inches not counting the main gun barrel extension affect. Width approximately 8 feet 7 inches. Armament – One 75 mm M3 L/40 main gun or one 76 mm M1 main gun with one Browning M2 .50 caliber machine gun and two M1919A4 Browning .30 caliber machine guns. Armor – as much as 3 inches in specific areas. Powerplant – One Continental R975 air cooled radial engine with 400 horsepower, the M4A4 had a Chrysler A57 Multibank 30 cylinder 1,281 cubic inch 470 horsepower engine. Transmission – One Spicer manual, synchromesh transmission with four forward speeds plus one overdrive and one reverse speed. Maximum speed 30 mph on paved roads. Range approximately 120 statute miles on 170 U.S. gallons of fuel. In production from approximately 1941 to 1945 with over 49,000 built by numerous companies including American Locomotive Co., Baldwin Locomotive Works, Detroit Tank Arsenal, Federal Machine and Welder Co., Fisher Tank Arsenal, Ford Motor Company, Lima Locomotive Works, Pacific Car and Foundry Company, Pressed Steel Car Company, and the Pullman-Standard Car Company. The M26 Pershing main battle tank was the first heavy tank produced for the U.S. Army. Designated a heavy tank due to its 90 mm main gun it would later be redesignated a medium tank when the M103 was developed carrying a 120 mm main gun. With its late introduction the M26 saw limited action in WWII while it was armed comparable to the German Tiger I and Panther tanks. Due to its lack of power it was pulled from combat duty in the Korean War theater as it was out matched by the Soviet T-34 series tanks supplied to North Korean. Throughout its life the M26 was mechanically unreliable and underpowered in the field. Throughout its life the M26 was subjected to numerous improvement programs and test concepts. However, it was replaced M46 Patton which appears to be a modified and improved M26 through a new production effort. The M26 is also a bit of controversial as to why it was not deployed in large numbers earlier in Europe. It appears the Army’s ground forces wanted fast tank killer systems than large tanks. In the history of time lines and comparisons, the M4 Sherman appeared to be adequate with a 70 mm main gun until the latter part of 1943. With the problem prone M26 program influenced by a supply line to the European Theater of Operations of over 3,000 miles rapid supply and dependability seemed to overrule troublesome and powerful. Length approximately 20 feet 9 1/2 inches not counting the main gun barrel extension affect. Width approximately 11 feet 6 inches. Height approximately 9 feet 1 ½ inches. Empty weight approximately 46 tons. Armament – One 90 mm M3 main gun, one M2 .50 caliber machine gun and two M1919A4 .30 caliber machine gun depending on the version / modification. Armor – 4 inches of homogeneous steel armor on the upper hull section and 3 inches on the lower hull. Powerplant – One Ford GAF 8 cylinder gasoline engine with approximately 450 horsepower. Transmission – General Motors (cross drive) CD-850 with two forward ranges and one reverse range. Maximum speed approximately 25 mph on paved roads and 5 mph on rough terrain. Range approximately 100 statute miles. In production from approximately 1944 to 1945 with more than 2,200 produced by the Detroit Arsenal. The M47 Patton is the follow-on to the M46 Patton tank and as a replacement to the M4 Sherman tank. Interestingly it is the only Patton series tank never to see combat as a U.S. Army or Marine Corps tank. The M47 Patton tank was developed to address mobility and reliability issues with the M26 Pershing. It appears to have been the integration of the M46 Patton body with the turret from the never made it past basic design T42. The M47 was the last U.S. designed tank to carry a bow mounted machine gun. The needle nose and sloped sided turret were design features intended to improve ballistic protection for the crew of four. Equipped with the M12 stereoscopic range finder which required protrusions from both sides of the turret the operational introduction of the M47 was delayed. With its delayed introduction to operational service the M47 was also rapidly superseded by the M48. At that point the M47 Patton series tanks were relegated to infantry support tanks and then the reserves for a short period of time. Than their life came to an end as training targets for systems such as the M60 series. Numerous foreign governments were operators of the M47 and most of those have since been retired from military service. Length approximately 27 feet 11 inches and I believe this is counting the main gun barrel extension affect. Width approximately 11 feet 6 ¼ inches. Empty weight approximately 48.6 tons. Armament – One 90 mm M36 main gun, two M2 .50 caliber machine guns and one M1919A4 .30 caliber machine gun depending on the version / modification. Armor – 4 inches of homogeneous steel armor. Powerplant – One Continental AV-1790 V12 air cooled twin turbo gasoline engine with 810 horsepower. Maximum speed approximately 37 mph. Range approximately 100 statute miles on 233 U.S. gallons of fuel. In production from approximately 1951 to 1953 with more than 9,000 produced by the Detroit Arsenal and the American Locomotive Company. There are at least two M47 Patton Tanks at the Museum. Both are in good, display, condition. This is one of them. The M60 is classified as a main battle tank. While often referred to as the Patton since it superseded the M48 Patton tank I can find no “name” assigned to the M60. Introduced in 1960 entering official service in 1961 the M60 is still in service in many areas of the globe even though it was officially retired from U.S. service in 1997. Over 15,000 M60s in various configurations were produced by the Detroit Arsenal Tank Plant of Chrysler from 1960 into 1987. The key differences between the M60 and its predecessor include three support rollers on each side supporting the rearward moving track as opposed to the M48’s five and a flat front slope on the M60 rather than the M48’s sloping or curved front. The M60 also marks the last U.S. main battle tank using homogeneous steel armor as well as a bottom mounted escape hatch. The bottom mounted escape hatch was primarily installed for the driver who’s upper hatch could be blocked by the gun barrel or turret. Homogeneous steel armor is steel that is hot-rolled to increase its strength through alignment of its grain. The M60A1 improvements commenced in 1963 with a better turret assembly, improvements in the armor, shock absorbers, and a stabilization for the main gun. This stabilization system was not an affective targeting system but kept the gun pointed in the general direction of the target which enabled better use of the coaxial (paraxial) machine gun. The M60A2 improvements commenced in 1980. The M60A2 was often called “The Starship” due to its (space age) electronic enhancements. The low profile turret with a machine-gun cupola for the tank commander actually added to a criticism of the M60 from Day 1 – its high profile. The M60A3 program began in 1978 including a laser range finder, the M21 ballistics computer, and a better turret stabilization system. A minor change with a major impact was the inclusion of an exterior to interior telephone system for tank crew to infantry communications. The M60 series was exported to and operated by several foreign governments and it remains in service in several of those countries as of 2014. 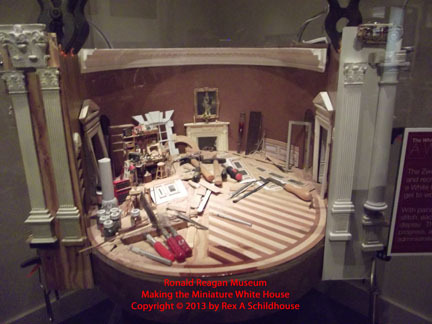 Length approximately 22 feet 9 ½ inches not counting the main gun barrel extension affect. Width approximately 11 feet 11 inches. Height approximately 10 feet 11 inches. Empty weight for the M60 20.7 tons, M60A1 52 – 54 tons depending on the turret and other modifications. Armament – one 105 MM M68 gun with one or more M85 .50 caliber machine guns. Armor – as much as 6 1/8 inch in various locations of the tank body. Powerplant – One Continental AVDS-1790 V12 air cooled twin turbo diesel engine with 750 horsepower. Transmission – General Motors cross-drive single stage with two forward speeds and one reverse speeds. Maximum speed approximately 30 miles per hour on paved roads. Range approximately 300 statute miles on 385 U.S. gallons of fuel. In production from approximately 1960 to 1987. There are quite a few M60s in various conditions at the Museum. Several are in good, display, condition. Several are hulks with various pieces removed slowly sinking into the decomposed granite / sand of the Museum's display area. The M578 Light Recovery Vehicle utilizes the same chassis as the M107 self-propelled gun and the M110 self-propelled howitzer. The cab / crane can fully traverse its chassis and had a lifting capability of 30,000 pounds. A winch on the forward area of the cab has a pull capacity of 60,000. These weight limitations restricted its service to medium and heavy tanks. As such the M578 was usually deployed with infantry units in support of light armored vehicles and heavy trucks. The M578 has served with the U.S. Military as well as with Israel and the United Kingdom. It saw action during the Vietnam War. Over 1,900 were produced. Length approximately 18 feet 3 inches. Width approximately 10 feet 4 inches. Height approximately 8 feet 7 ½ inches. Empty weight approximately 54,000 pounds. Armament – One Browning .50 caliber M2 machine gun. Armor – Estimates at 4 inches for most of the chassis and 1 ½ inch for the cab. Powerplant – General Motors 8V71T, V-8, 2 cycle supercharged diesel engine producing approximately 345 horsepower. Range approximately 450 statute miles. I had problems finding data on the M936 Military 5 ton Wrecker. What I could find is that is a 6x6” – six tires and all powered. The picture shows them as floatation tires. There is a 45,000 pound winch on the rear of the unit and the “5 ton” title implies it can lift 10,000 pounds to the height of its 20 foot boom. The front winch is rated at 20,000 pounds. The engine is a CUMMINS 8.3L TURBO INTERCOOLED diesel with a five speed Allison MT654. It has a wheelbase (measured from the center of the front axle to the center of the most rear axle) of 179 inches, just under 15 feet. The fuel capacity is 140 gallons with 70 gallons on each side of the cab. The M35 series of military trucks form the generic group of “deuce and a half” for their initial cargo capacity of 2 ½ tons or 5,000 pounds. These vehicles are the follow-on to the famed trucks used by the Red Ball Express and just about every other Allied transportation unit since the early 1940s. This particular version entered military service from REO Motor Car Company in 1951. REO Motor Car was founded by Ransom E. Olds. A company previously owned by R.E. Olds, the Olds Motor Works, became what is known as Oldsmobile of the GM hierarchy. The M35 series trucks are manufactured by REO, Kaiser, AM General, Kia for South Korean only, and Bombardier for Canada only. The M35s are in service with numerous foreign governments as well as many civilian operations and numerous military collectors. Production starts and stops with military orders. These trucks to an extreme untypically rugged. During my military service our loading instructions were not by weight but by sound. “Load it till it really groans, then take one box off and go.” The ride is uncomfortable but bearable for long durations in the cab. In the bed the ride is simply bearable until you can get out. The engines and transmissions failed to maintain any standard except to say it is a 6 cylinder multi-fuel engine, a five speed manual transmission with a separate two speed transfer box. However, as common to commercial heavy trucks the engine and transmission mounts are somewhat universal. By multi-fuel, just about anything that burns EXCEPT GASOLINE!! While gasoline can be used “straight” in an emergency it is recommended only in an emergency even if mixed with engine lubrication oil to lubricate the injectors better than pure gas but less than adequately. Engine manufacturers and engines include OA-331 Continental Gas I-6, the LDS-427 Turbo Multifuel I-6, the LDS/LDT-465 Multifuel I-6, and the Caterpillar 3116 Diesel I-6. Most of these are in the 125 to 175 horsepower range. The M35 has a 450 mile range at a top speed of 55 MPH. These trucks are fun to take “four wheeling” and will embarrass most commercially available four wheel drive vehicles. With a high ground clearance and floatation tires as well as an engine / transmission coupling designed for rugged terrain rather than a trip to the shopping center these trucks will auger through just about any grade or stream without a hiccup. Where they lose to that chrome plated four wheel drive goody you bought from a local dealer is at the gas pumps. The DUKW (Dual Universal Karrier, Wheeled) or “Duck” is based on the GMC AFKWX. This is a cab over engine military transport truck. The yacht firm of Sparkman & Stephens partnered with General Motors to create the DUKW to meet a military requirement in the early 1940s. The DUKW as produced from 1942 into 1945 with more than 21,000 rolling off the assembly lines of GMC. Empty the DUKW weighs 13,000 pounds with an overall length of 31 feet, a width of 8 feet 3 inches, and a height of 7 feet 1 inch if the armament ring was not installed. The DUKW could be armed with one .50 caliber Browning machine gun. Powered by a GMC 6 cylinder, 269 cubic inch engine with 94 horsepower the DUKW could carry up to 5,000 pounds. Speed on pavement was up to 50 mph while it could attain 6 mph in the water. With these environments it had a road range of 400 miles and a water range of 60 miles. 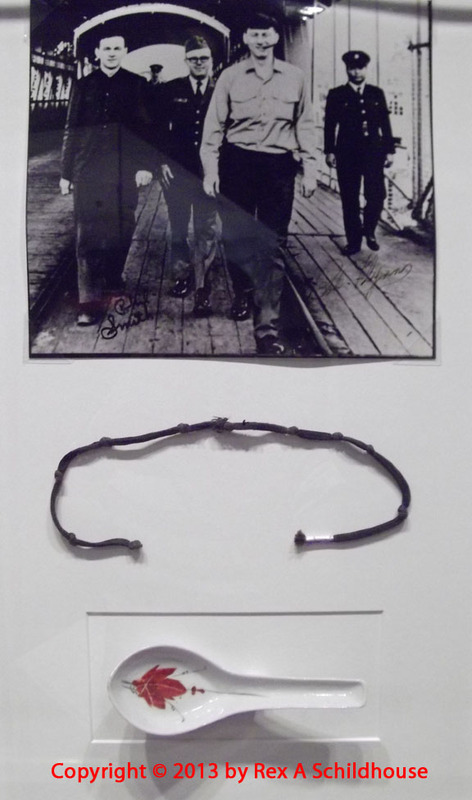 Water propulsion was accomplished with a large center mounted propeller protected by the hull formed tunnel. 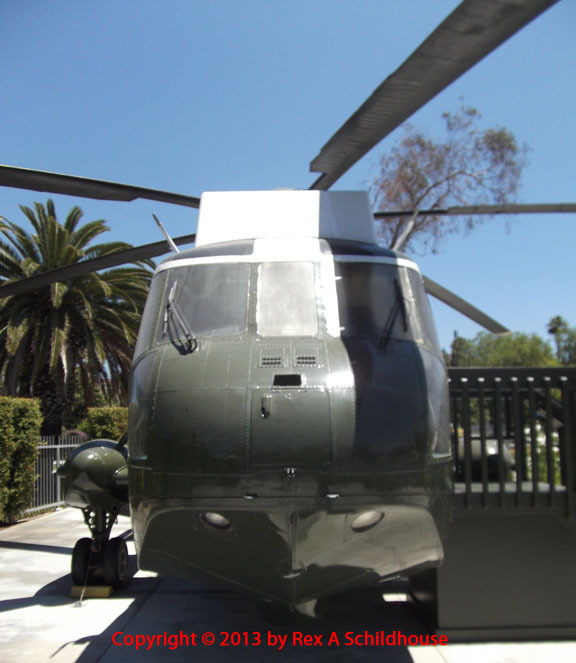 Due to the ladder attached to the Museum’s donated DUKW the propeller tunnel was not visible. DUKWs were stable on both land and water and many were used extensively as land vehicles well inland during combat operations. Europe has numerous streams and brooks as well as major rivers which needed to be crossed. The only real problem the DUKW system found was banks that were too steep or drops that did not provide ground clearance. Many DUKWs remain in operation today as tourist vehicles. The first operator, Original Wisconsin Ducks, began operating in 1946 and is still operating today. This is the photo lab trailer used at the Desert Training Center / Camp Young. T55 Firefighting and Riot Control vehicle – After a bit of a search, I could not find anything solid to this vehicle. I did find a reference to the GPM-54, modified into a tracked fire fighting vehicle from the T-54. It was equipped with a dozer blade in the front of the vehicle, water tank and a spray unit mounted on the front of the tank’s turret. Basic specifications for the T54/T55: Length approximately 21 inches. Height approximately 7 feet 8 inches. Empty weight approximately 80,000 pounds. Armament on the tanks – One 100 mm rifled gun, 7.62 mm coaxial machine gun, 12.7 mm heavy machine gun. Armor – Estimates at 4 inches for most of the chassis. Powerplant – Model V-55 V-12 water-cooled, diesel with 580 horsepower. I am a rail fan and have always have been. While at the Veterans Affairs Medical Center, San Diego, for a check-up I picked up a magazine about a railroad museum back in Illinois. 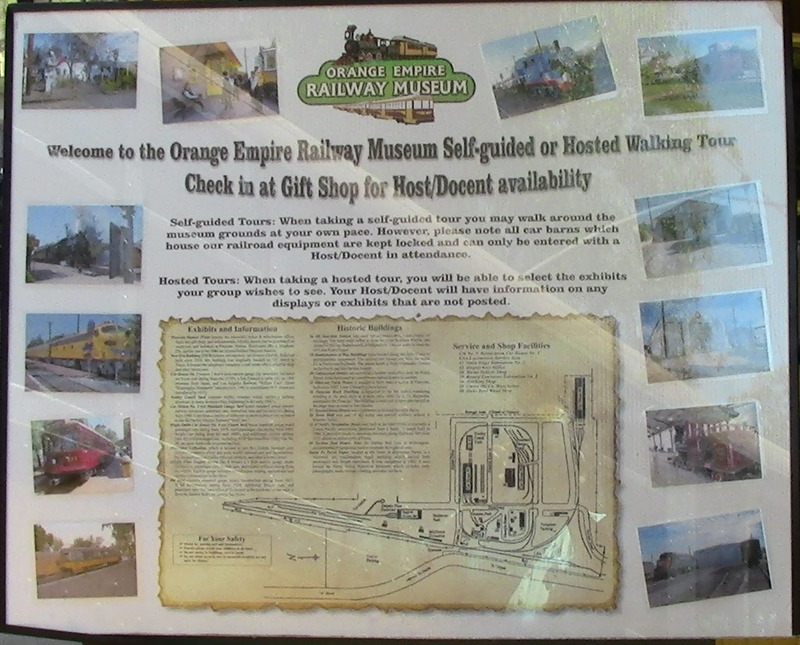 The magazine mentioned the Orange Empire Railway Museum in Perris, California. I am only about 1 hour and 15 minutes from Perris and never knew it was there. So Joyce and I made the trip. We were 1) totally surprised and 2) totally satisfied. The museum has free parking in an ample parking lot. The museum is free access, which makes it doubly nice. 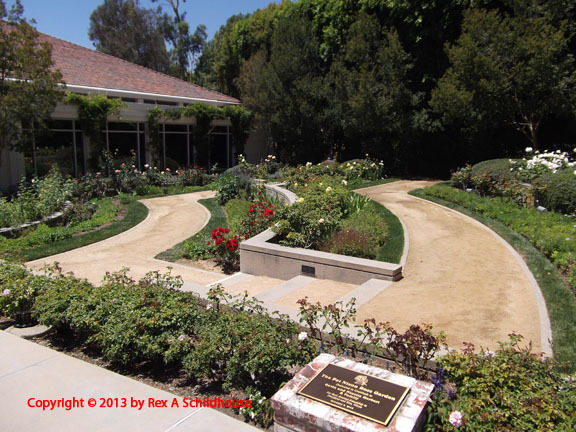 Donations are 1) optional, 2) more than appropriate for the work and accomplishments of the volunteers on displays, and 3) more than appropriate for the services received from the docent tour of the museum. Bring a picnic lunch if you want, plenty of space to enjoy it. We were on the museum grounds for about five hours and saw most of the museum and took several rides on trains and trolleys. You really need to buy an optional "train ticket" from the reception center / store so you can ride any of the the trains and trolleys all day long. One fare, unlimited rides. There is a special ticket to ride in the cab of the locomotives. Well worth the price. The trains and trolleys only run on weekends so consider that the time to visit. Cost-wise the snacks at the store are more than reasonable. I thought I recorded the name of the docent that gave us a rather complete tour of the museum. As I remember, it is Gary, if not, sorry. It was a super tour through all the barns and displays. Gary was extremely knowledgable about the displays and handled the tour very well. We picked up a family during our tour, I invited them. And Gary "worked" all of our various ages very well. We filled out the paperwork to join the museum in October 2017 and did not receive anything for about six weeks. We were "guided" into an associate membership by an individual in the reception building / gift shop. It was the wrong choice. I have sent several e-mails to info@oerm.org and membership@oerm.org and have NEVER received a response. In the welcome aboard package I received a document with all sorts of contact information about volunteering at various facets of the museum. I would later be told some of this "current" information is outdated. Since I am interested and kind of available, I sent off e-mails to most, if not all, the individuals in the packet. After several weeks I received a response from one person and one person only. After investing more than fifty hours and four hundred miles and accomplishing NOTHING I withdrew my offer of support. The museum has a program where you can learn to operate a locomotive. It is on their home page under Events/Activities and then Run One. I have made several phone calls to the reception center and been told every time that no such program exists and that it takes years and years of formal training before you can even touch the controls of a locomotive in accordance with Federal Railroad Administration (FRA) rules and regulations. I find interactions with many of the elements at the museum to be poor and inaccurate. Totally satisfied with some aspects of the museum, totally dissatisfied and disappointed with many other aspects of the museum. We have taken our Granddaughter, less than three years old as of January 1, 2018, up to the museum several times and she absolutely loves it. Their special events were very enjoyable and very reasonably priced. 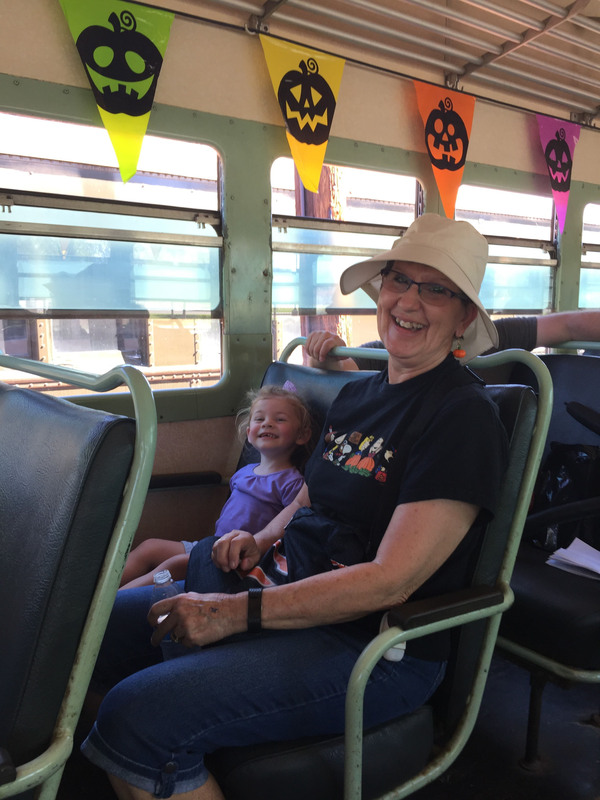 We participated in the Train To Santa’s Workshop and the Peanuts Great Pumpkin Patch Express in 2017. 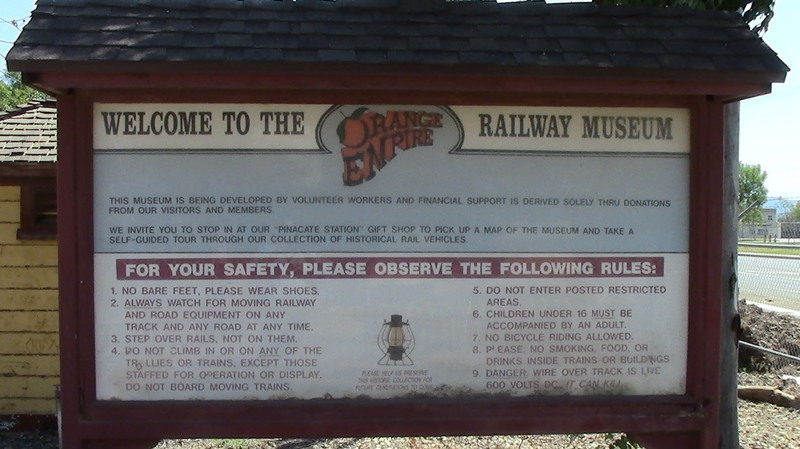 This is the entrance sign to the Orange Empire Railway Museum. 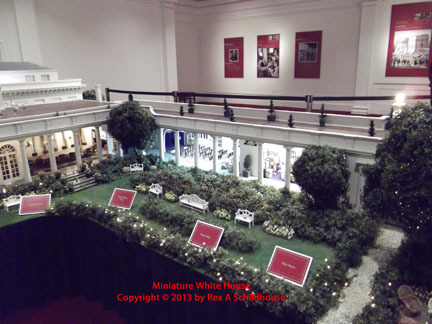 This is the layout of the museum, placed nicely just outside the station / store. Lots of information. There are two trolleys that make very nice tours around the museum's grounds. You can get off and on at the various stops if you have purchase a ticket. Our trolley operator did a great job. This is the other trolley that was running on the day we were there. We rode both. With the "1 ticket rides everything unlimited" why not? These are history on the rails. The interiors of the trolleys are period perfect. Here is one of the signs which provides the history of this trolley. Shirley Temple is the girl to the left of the center sign. 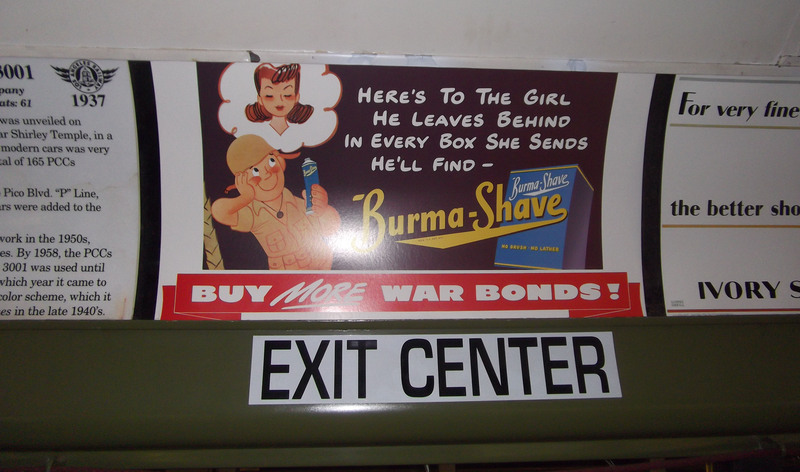 A Burma Shave sign from the WWII era. The trolley rides, unlimited with the purchase of a very low priced ticket, are relaxing and fun. Taking you back to an era long gone. Below is hypertext of one of several videos we took of one of our trolley rides. 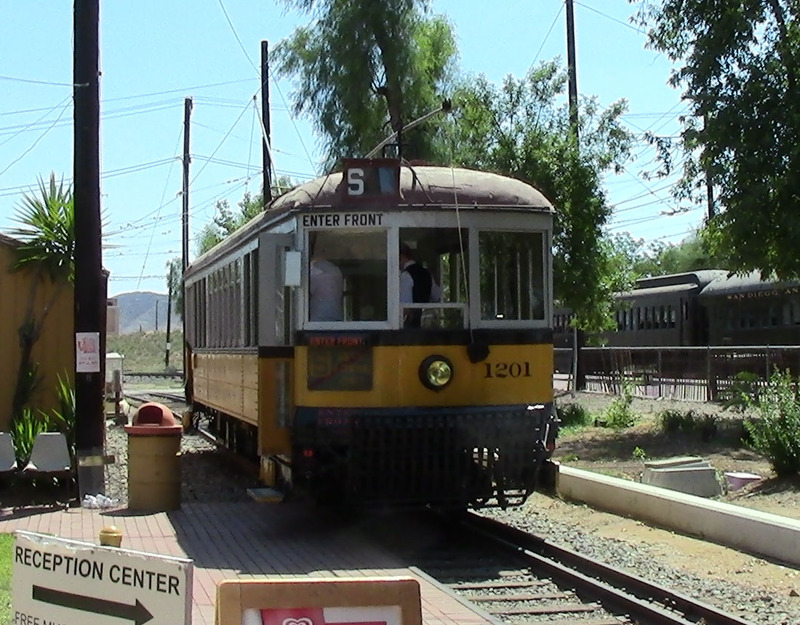 Click here for a video of a trolley ride on the 3100 / 68 trolley in the yard at the Orange Empire Railway Museum. Joyce and I rode on two trains and did one locomotive cab ride. The locomotive cab ride is well worth the extra, small fee. This is our engineer on the left, then Joyce, then me, and our fireman on the right. Annoyed I forget their names. It was a great ride. The ride is not long. About one mile down the straight track and back. Still, pretty cool. On our first train ride, in the passenger car, we got about halfway down the track and the train stopped for a short delay. Then we returned to the station and they said the locomotive had a maintenance issue. Not a big deal with those unlimited ride tickets. Our second passenger car ride went all the way to the end of the short track and back without incident. The trains' passenger cars are in good repair and comfortable. On our numerous rides the only time there were "a lot of passengers" was during special events and during those events they control the number of passengers by boarding times so you are not left standing in a moving train. The Buffalo-Springfield Steam Roller. Not everything at the museum is railroad and that is fine. I find this cool. I have not found any good information but I am guessing that this is 1920s. There is a good "information sign" by this beast. It is a Keystone Digger built in 1929 and used in Los Angeles until 1963. It is electrically powered by the trolley power system, 600 volts. It was used to tear up the pavement so tracks could be installed or repaired. 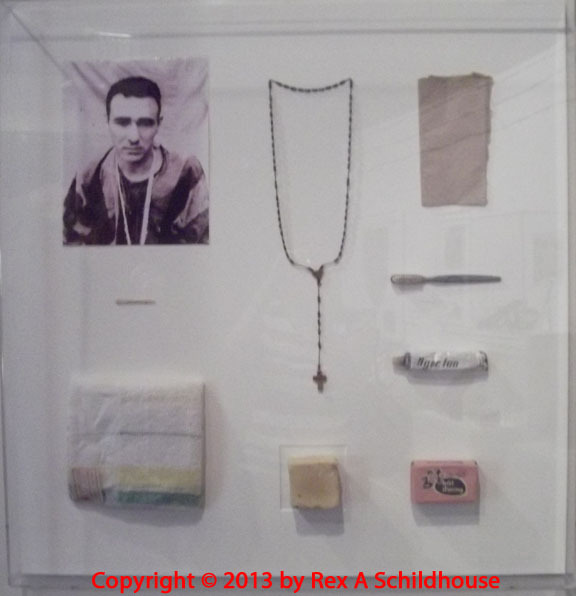 There are things at the museum that are not labeled or identified and no one we asked had clear, distinct answers. "Probably part of a diesel locomotive" is not a real good answer. By the labels, this is a Westinghouse DC Generator (left) and Synchronous Motor (right). Most likely what is driven by the diesel engine in the "diesel-electric locomotive." Not sure why a synchronous motor is required. This is not a train. It is a concrete structure that once served as a restaurant. 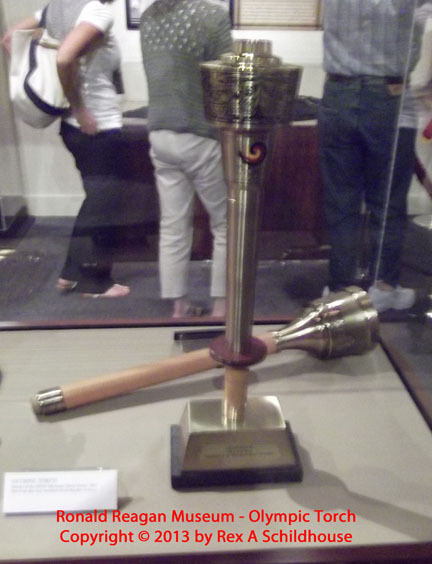 Kind of neat that the museum decided to preserve it. Much of the items inside the various barns are well labeled. This is a Huntington Standard Trolley, Nbr 525, built in 1906 by the St. Louis Car Company. The restoration and care is outstanding. As explained in one of the numerous signs, the device on the front is actually a pedestrian protection system designed to keep the trolley from running over people. This is an Electric Railway President's Conference Committee car - "PCC." More than 5,000 were built for service in the U.S. starting in the mid 1930s. This is in fantastic shape. Probably as good as when it rolled of the assembly line, if not better. And Wife is going for a ride. These were the days when change was given. This car was built in 1937. The interior of the Electric Railway President's Conference Committee car - "PCC." 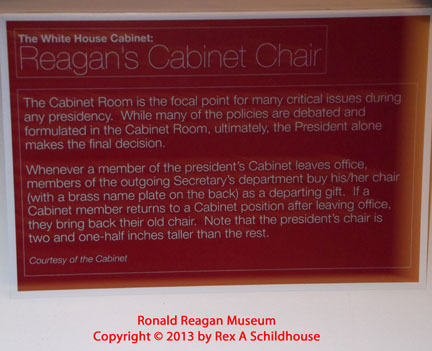 This signage is part of the quality of signs available at various parts of the museum. This shows a great deal of care and concern. 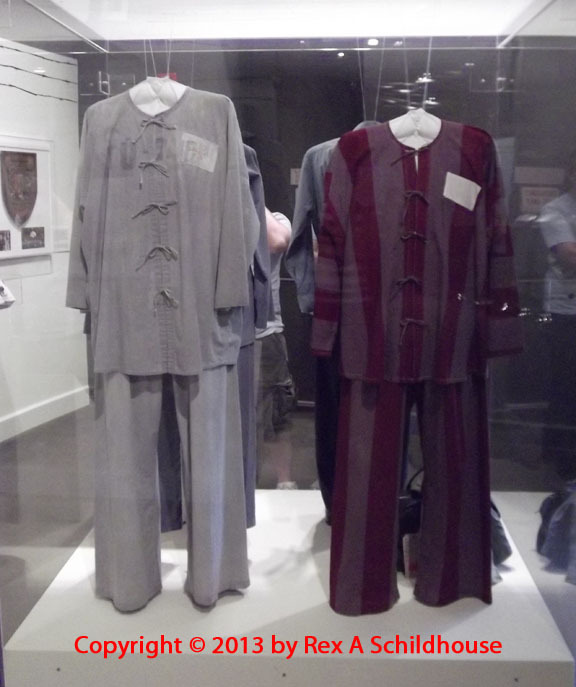 Numerous items around the museum have period posters within them. Pretty slick. This one is in the Electric Railway President's Conference Committee car. There is a well populated signal farm and some of them work. Since trolleys are now pretty much off the main roads, this is a good example of one on the way down its track. Notice the two power poles on the top of the trolley. 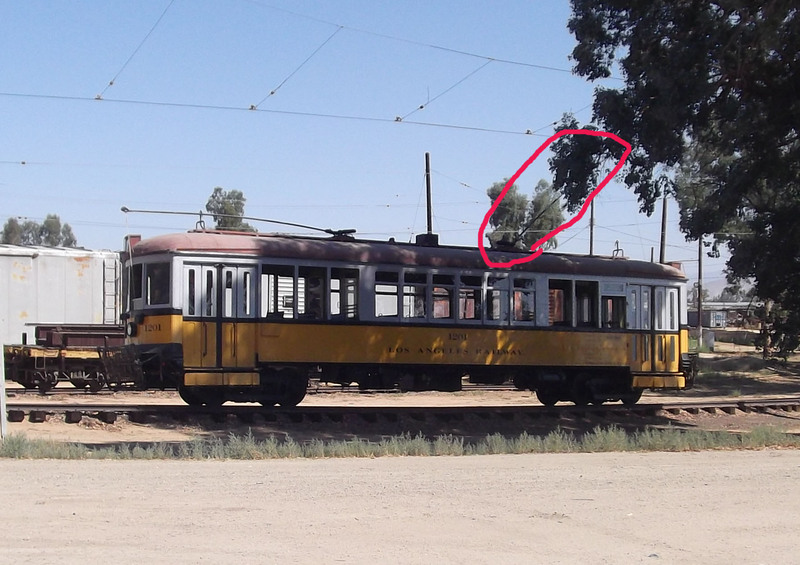 There is one "in the tree," that is well behind the trolley. Only one, directionally sensitive, is used at a time. The overhead wires are "hot" while the ground rail is neutral. When the trolley goes the other way one power pole is lowered and the other is raised. For the Great Pumpkin Charlie Brown event we took our than 2 1/2-year old Granddaughter up. To say it was a hit is a distinct understatement. She did not want to leave. She loved riding the trains and the trolleys. She loved looking at the displays. Here she is on the train with Grandmother. Dad's hand is visible.